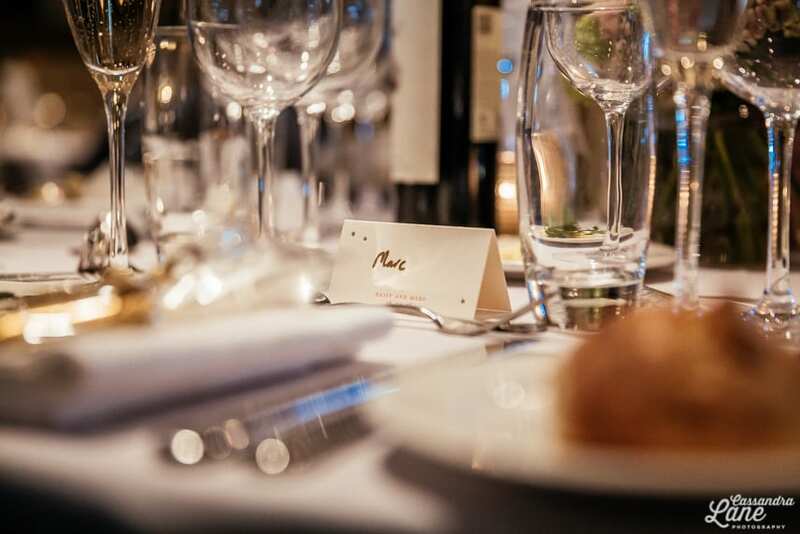 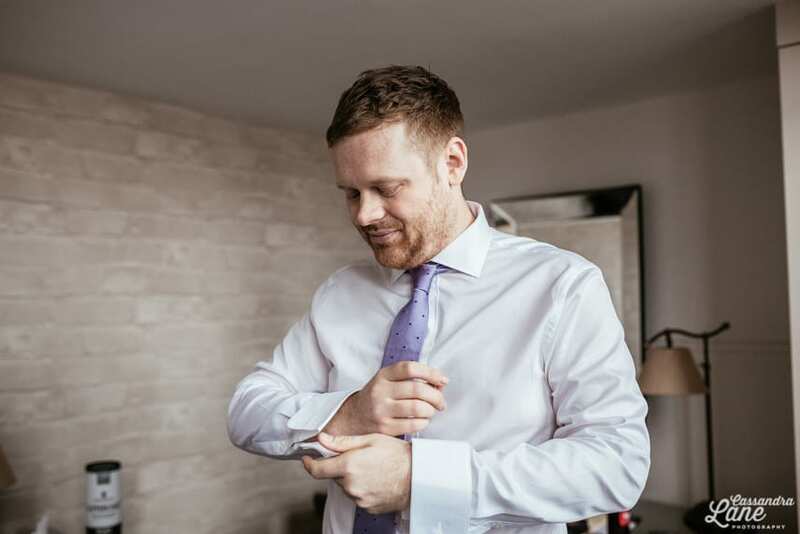 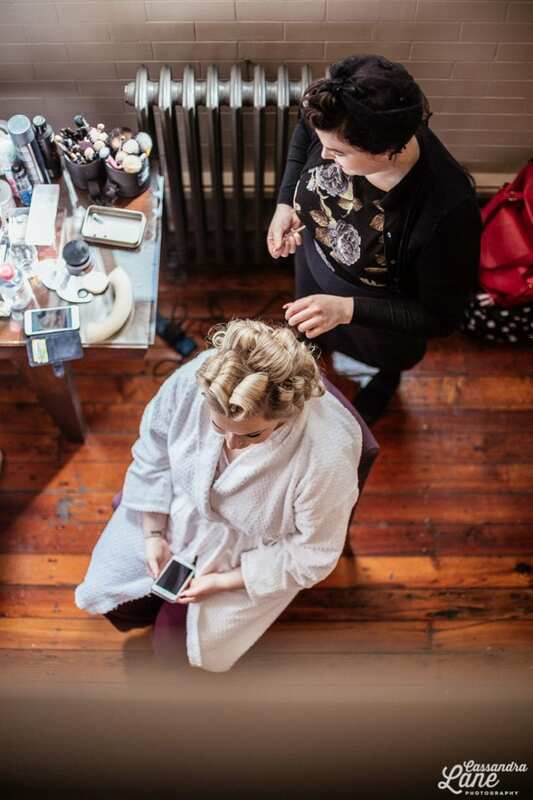 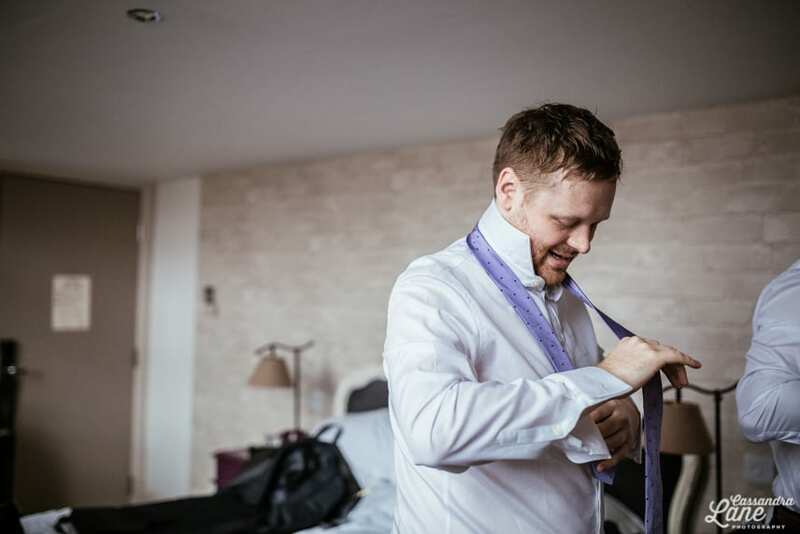 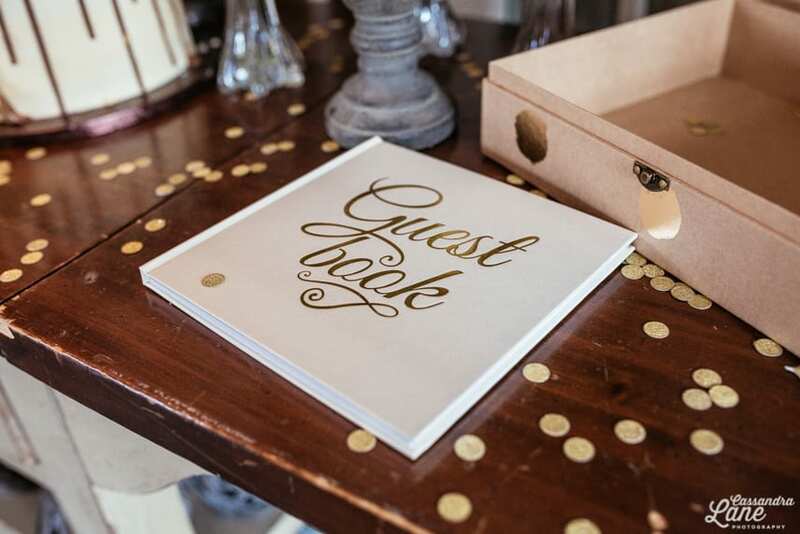 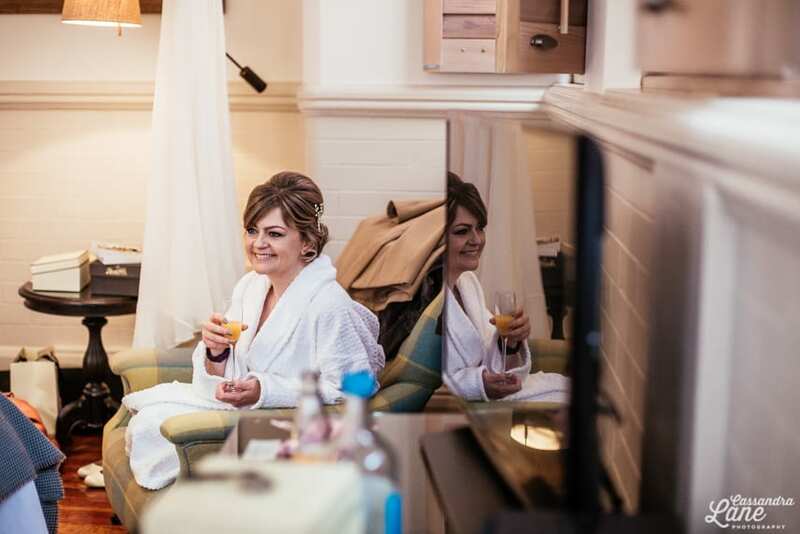 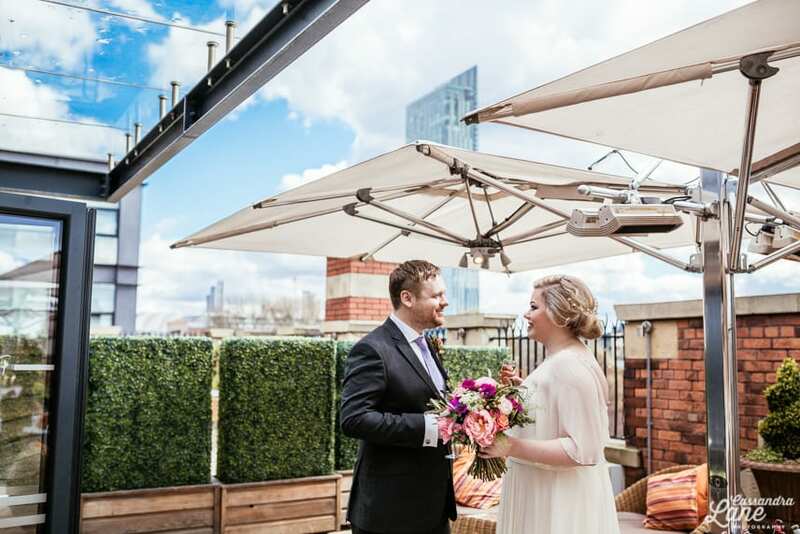 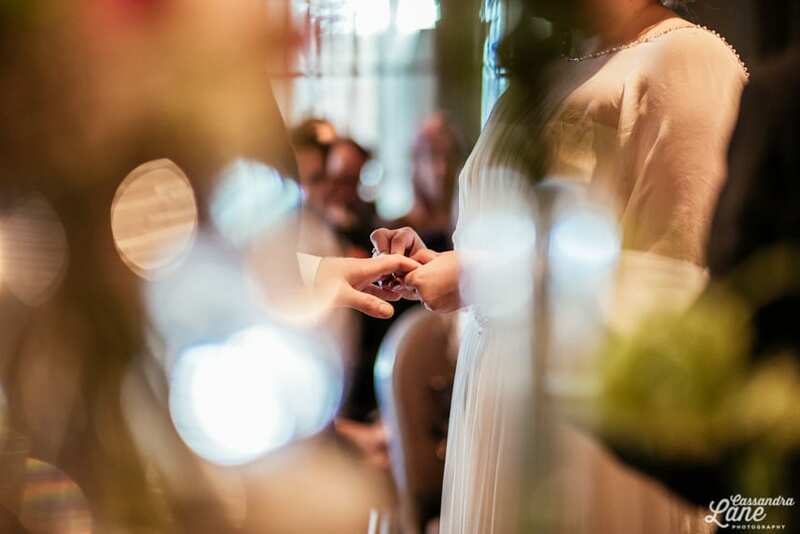 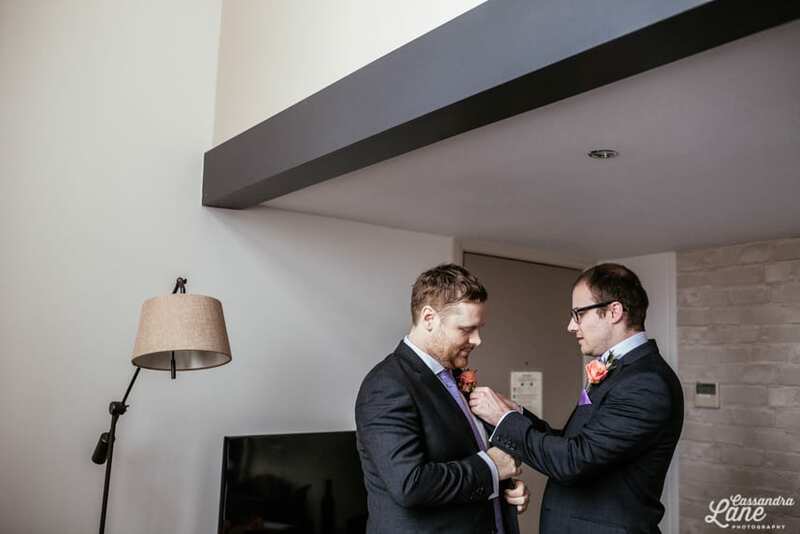 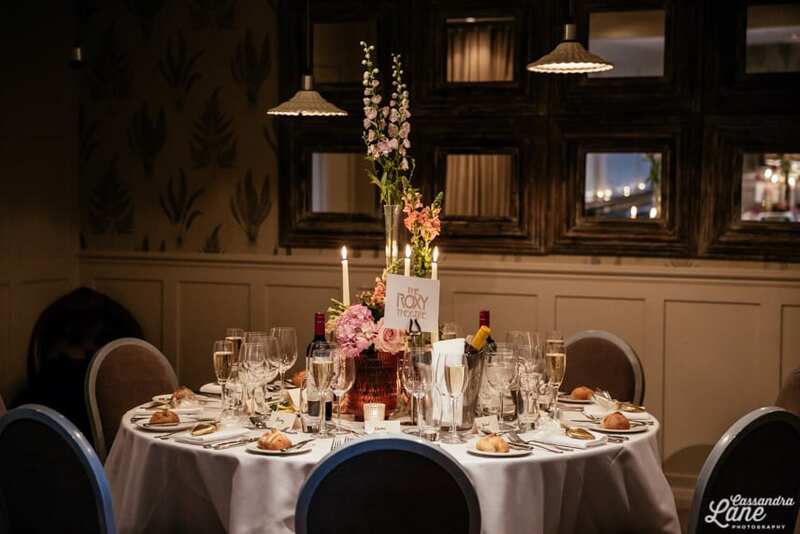 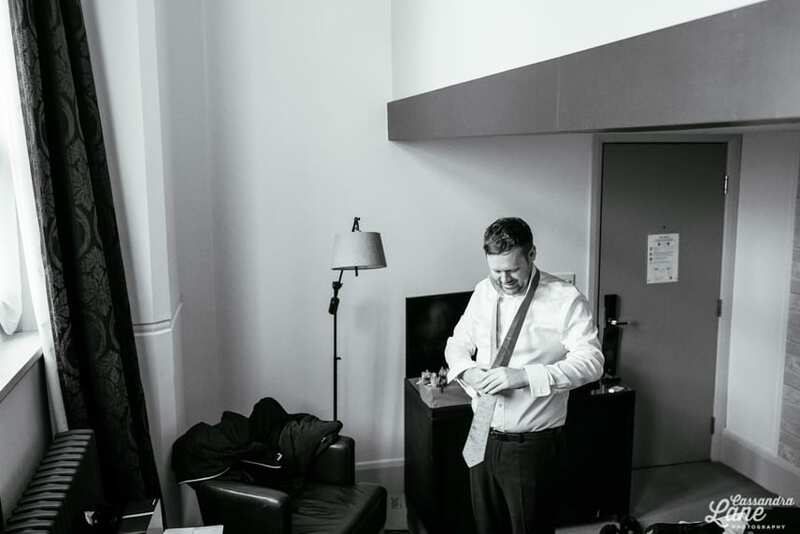 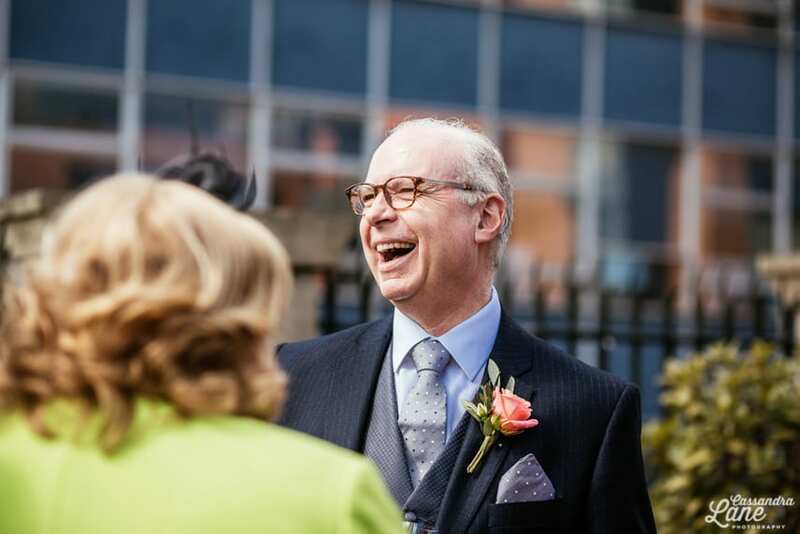 There’s something exciting about shooting a wedding in the heart of the city and you can’t get much more central than Great John St. Hotel in Manchester. 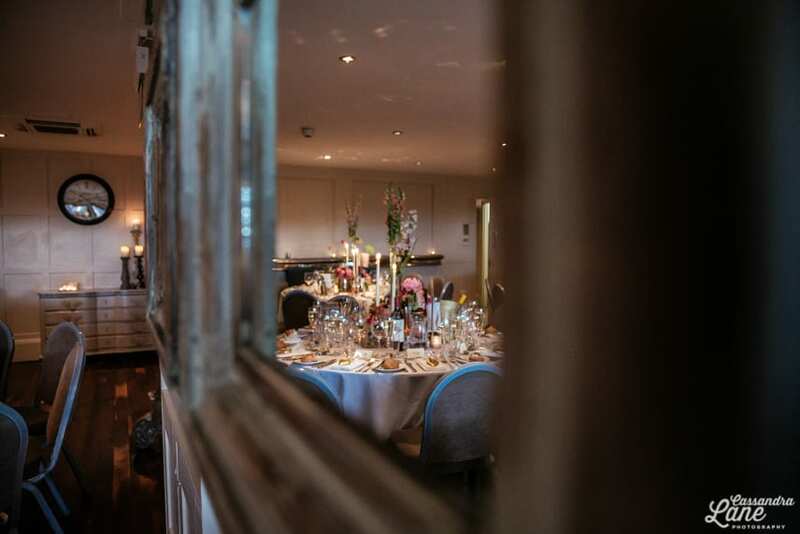 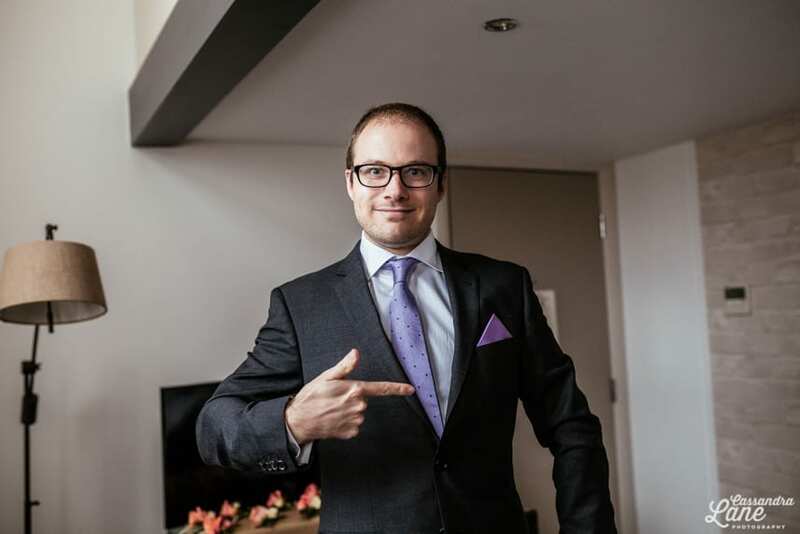 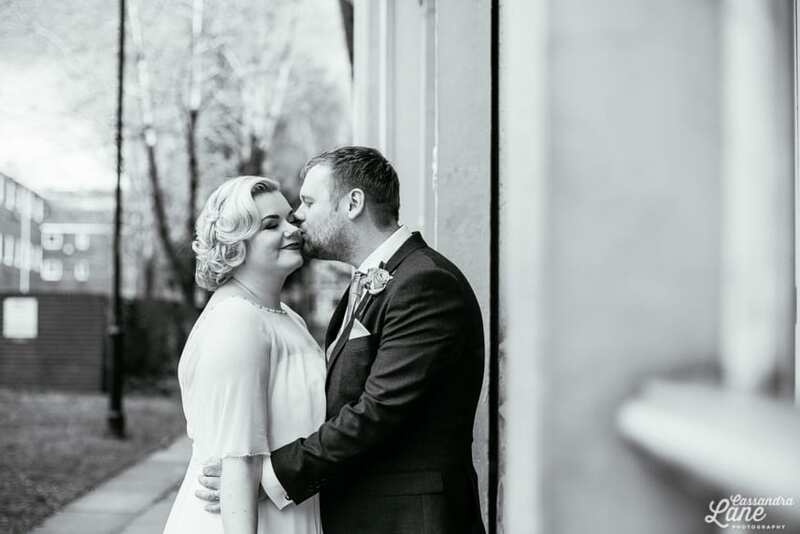 Daisy & Marc chose the venue for their wedding back in April and it was a stunning spring day with heaps of sunshine to boot. 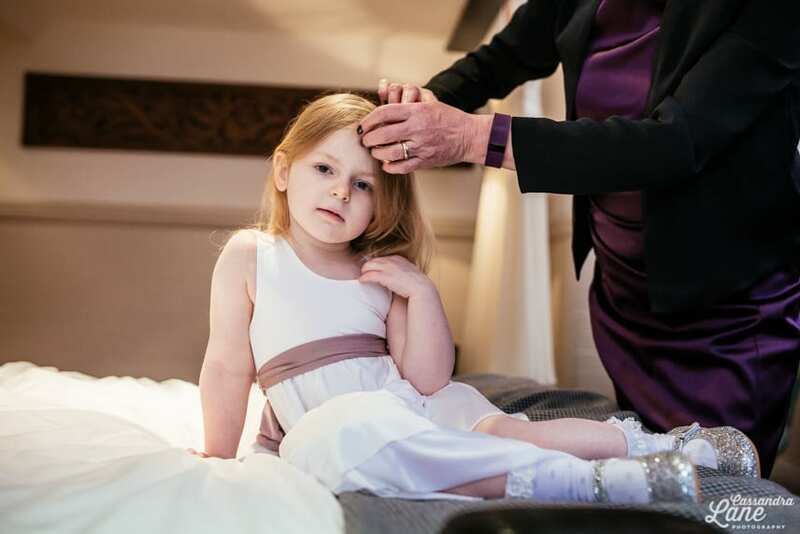 Daisy & Marc both got ready at Great John St. so I was able to spend time with both the boys and the girls during the preparations. 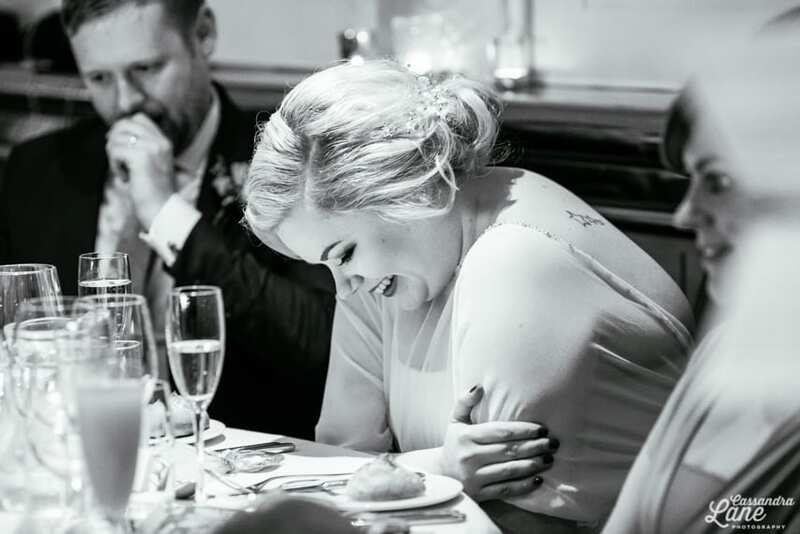 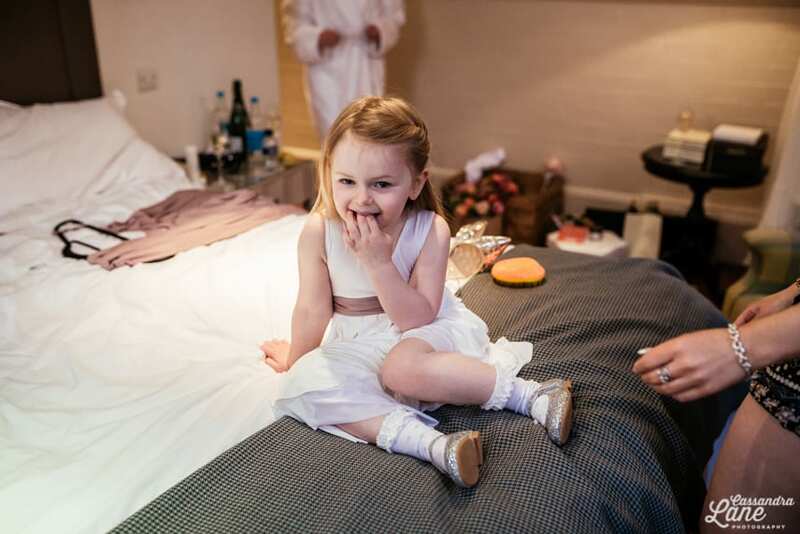 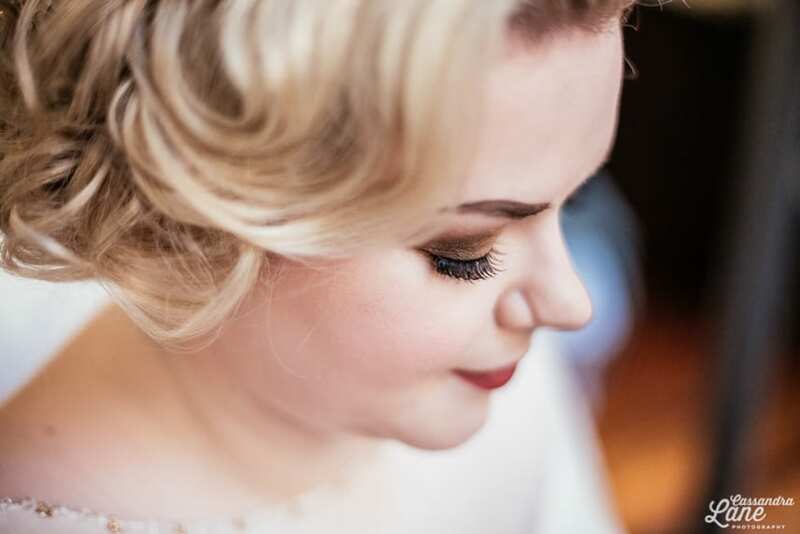 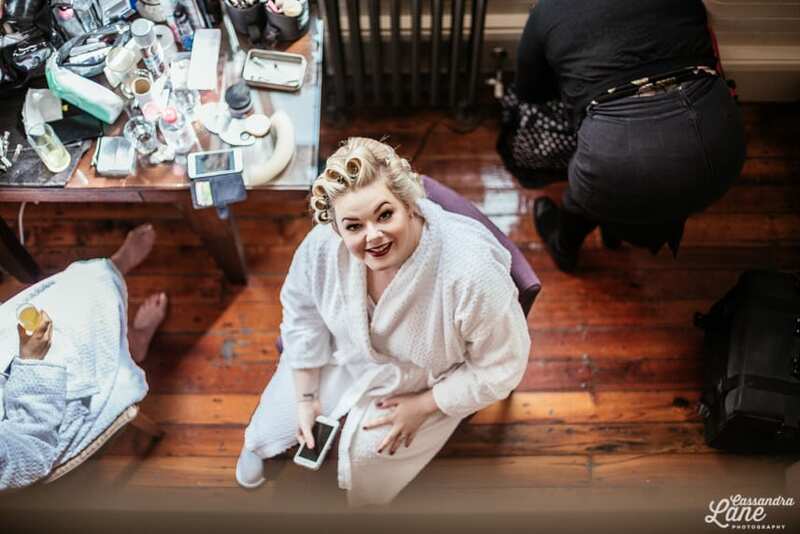 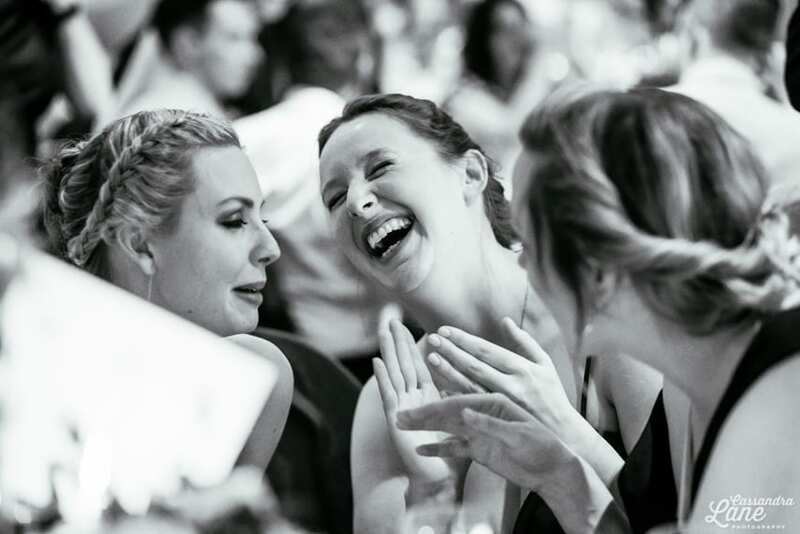 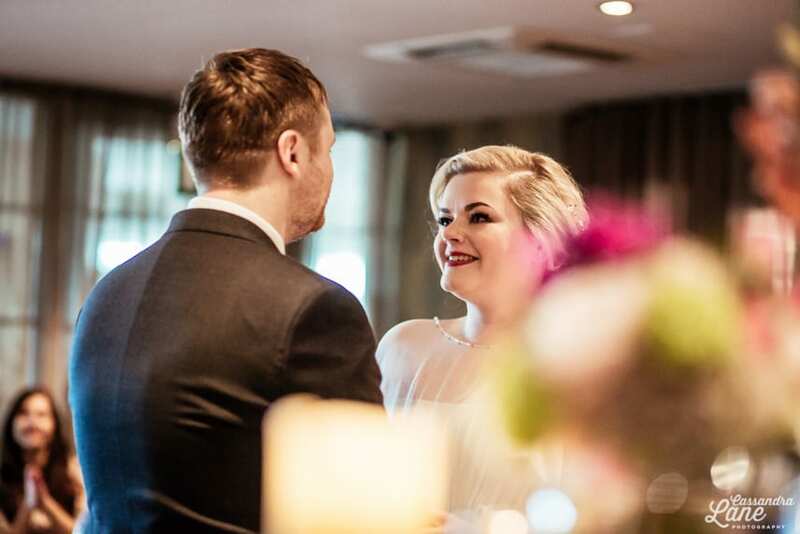 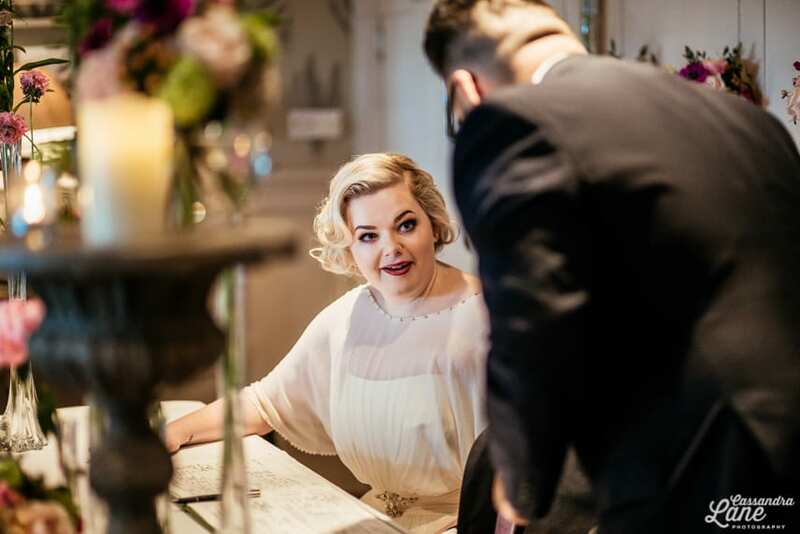 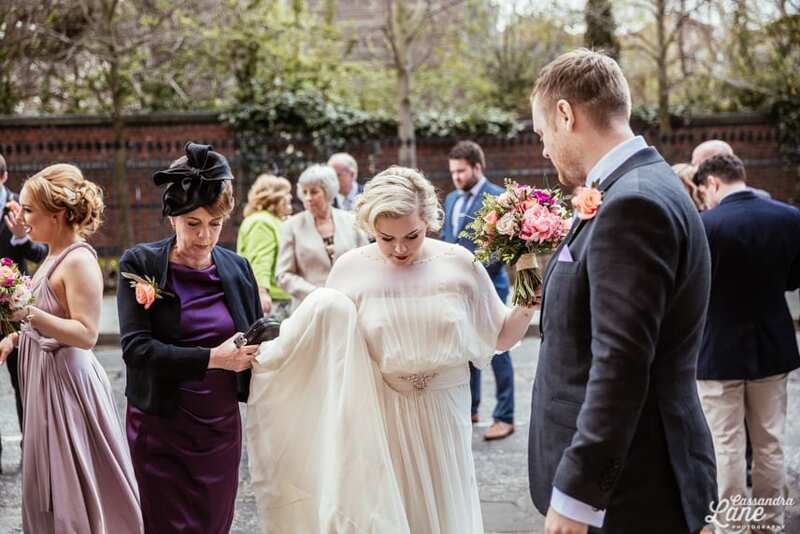 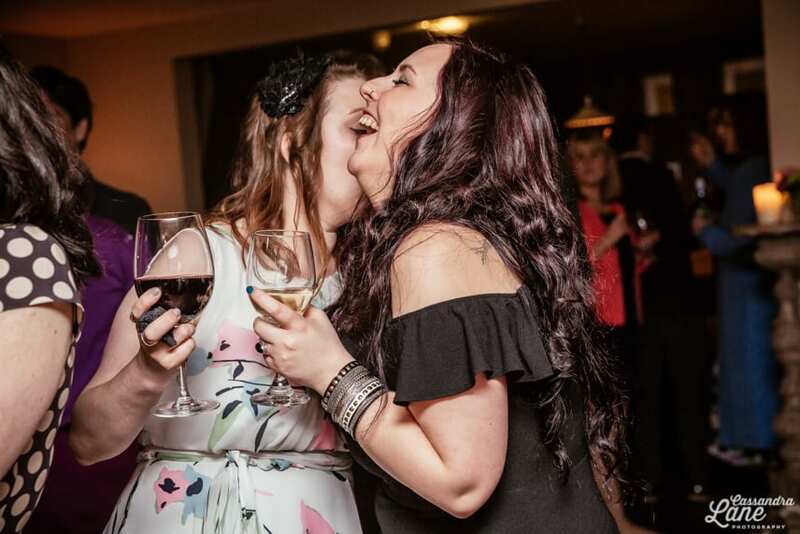 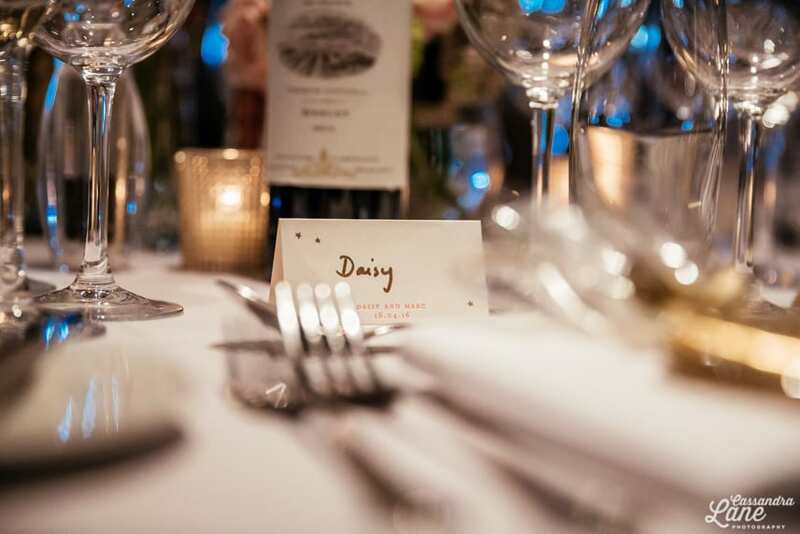 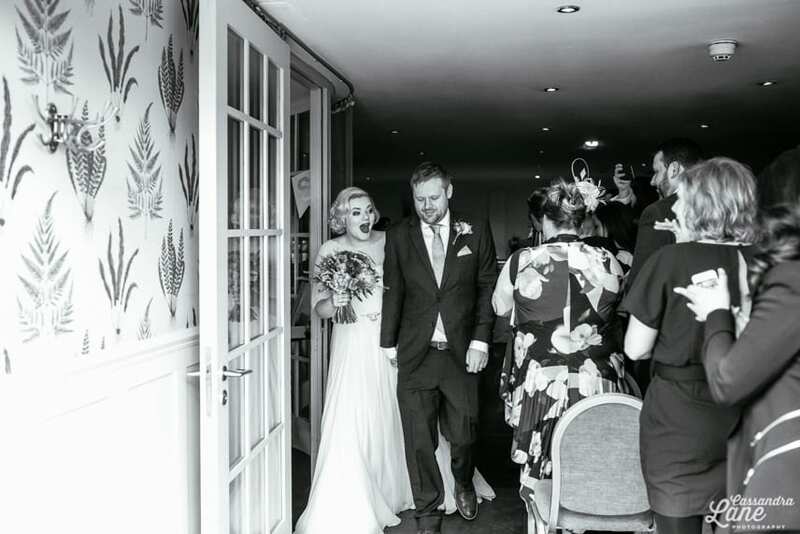 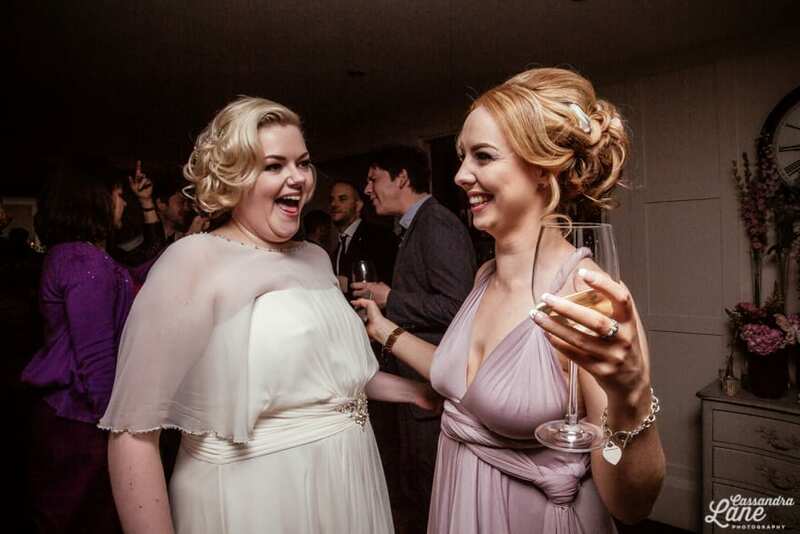 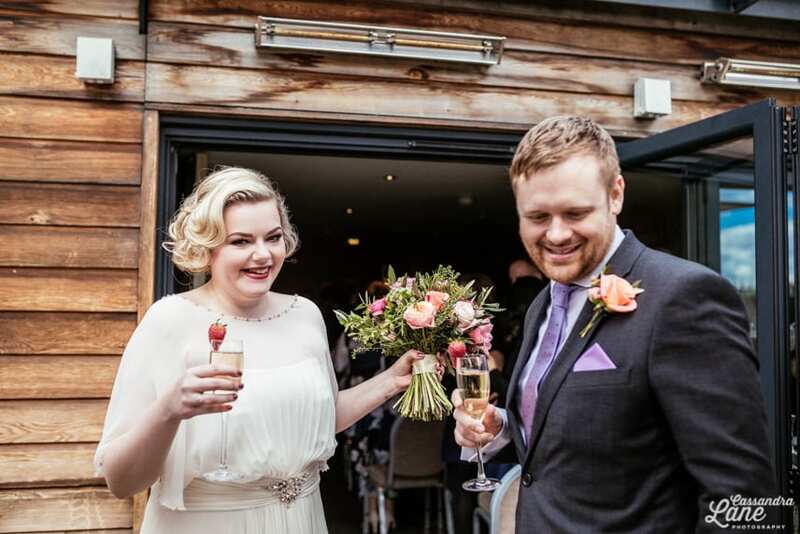 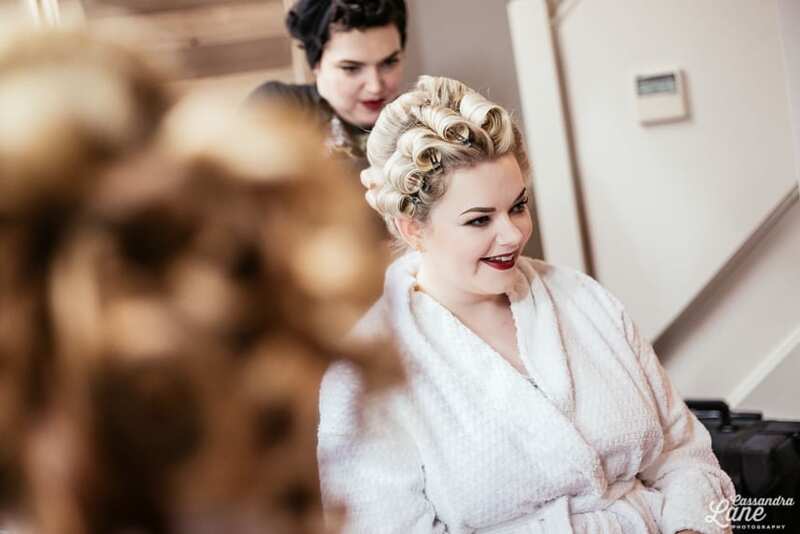 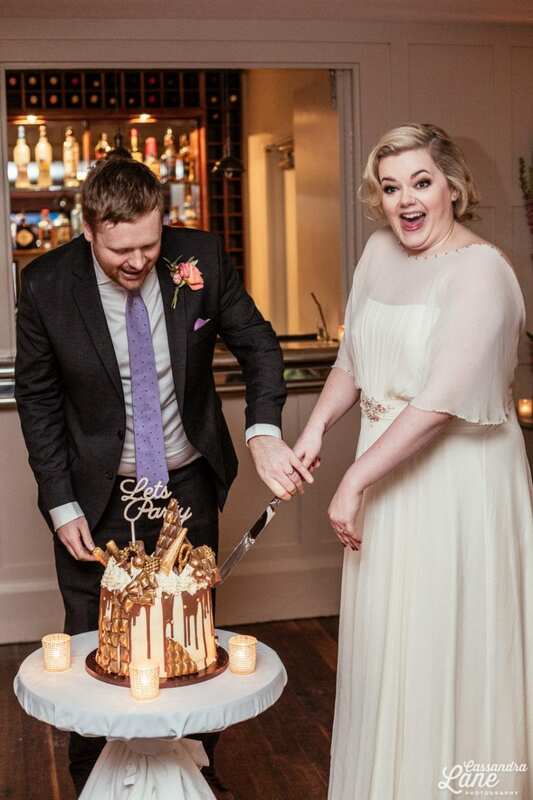 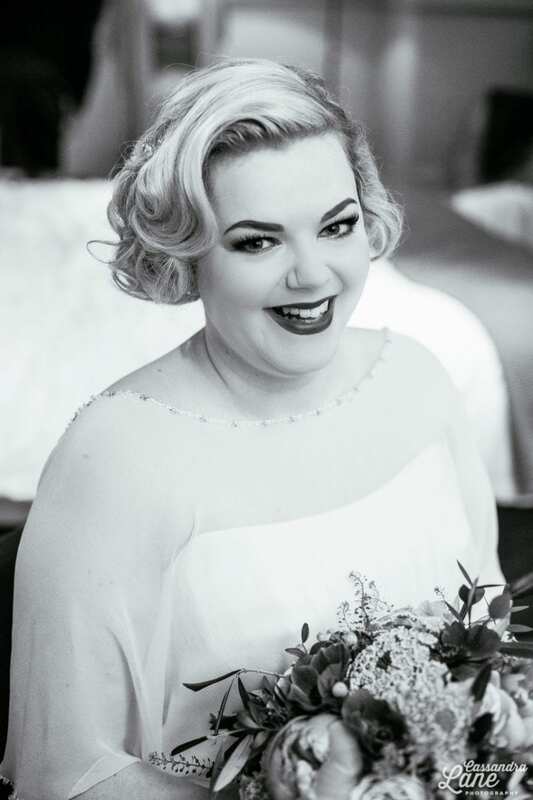 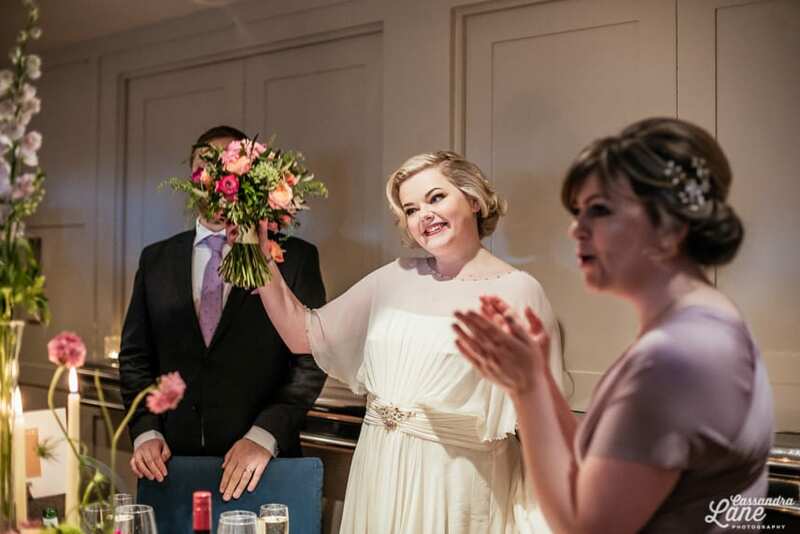 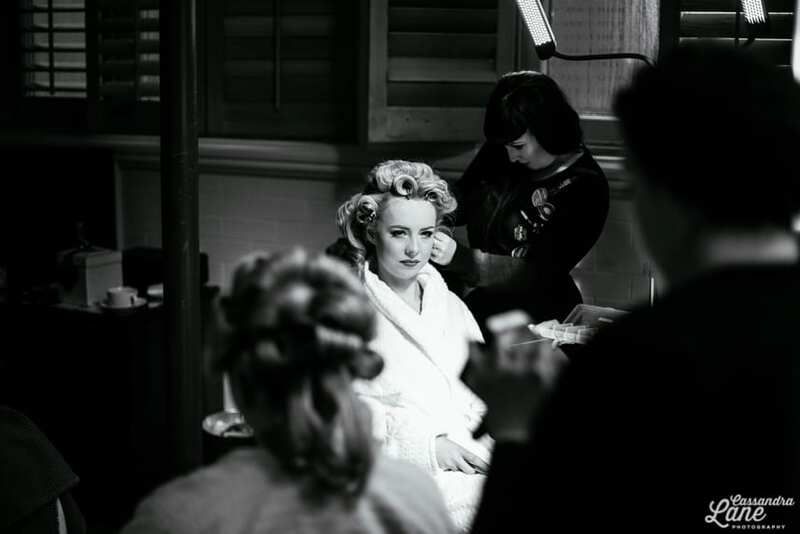 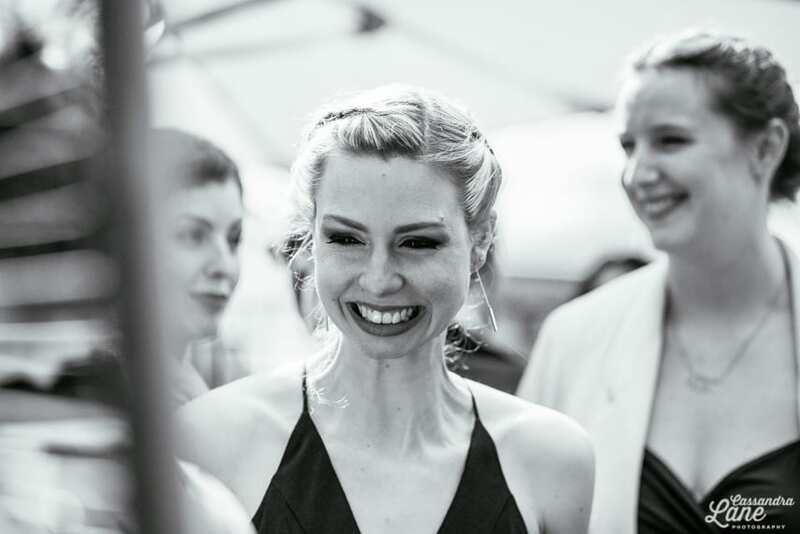 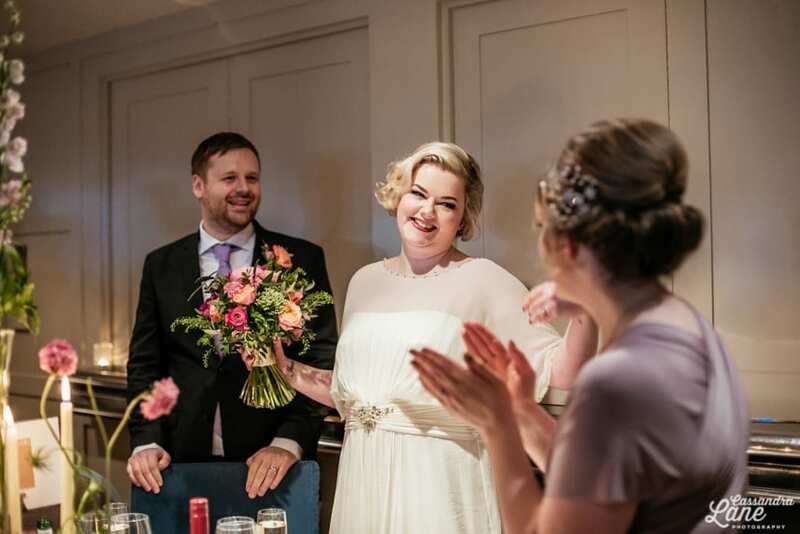 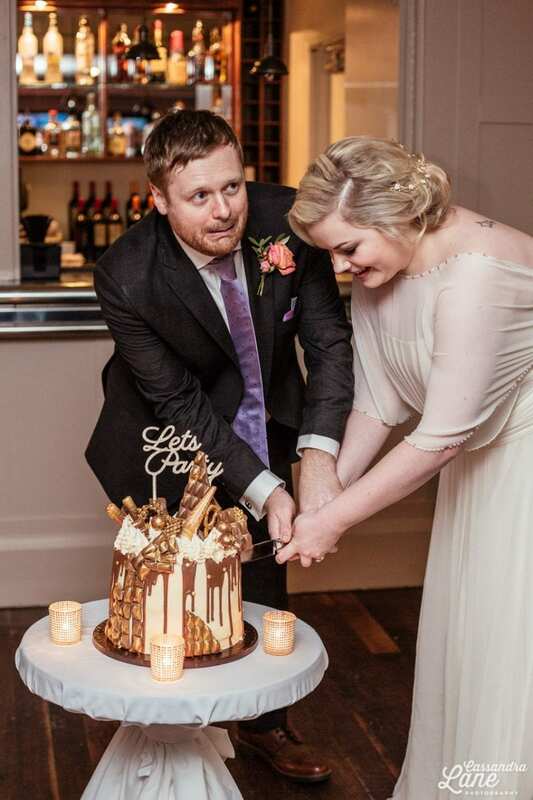 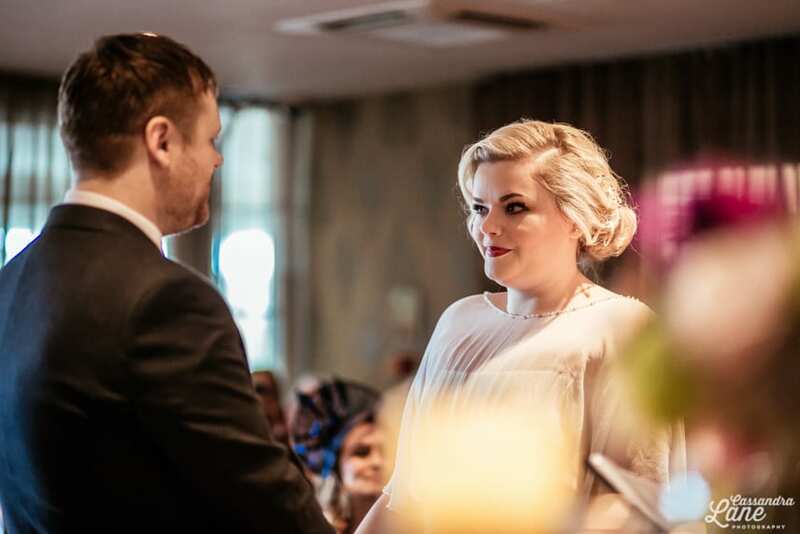 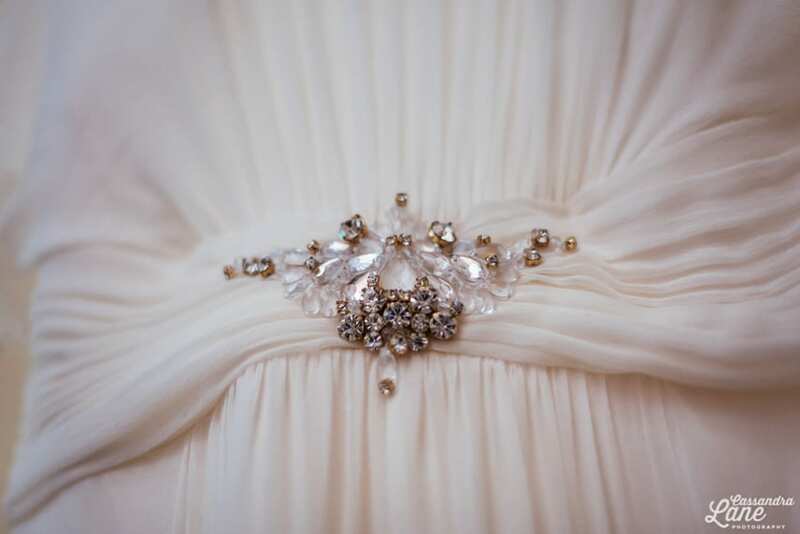 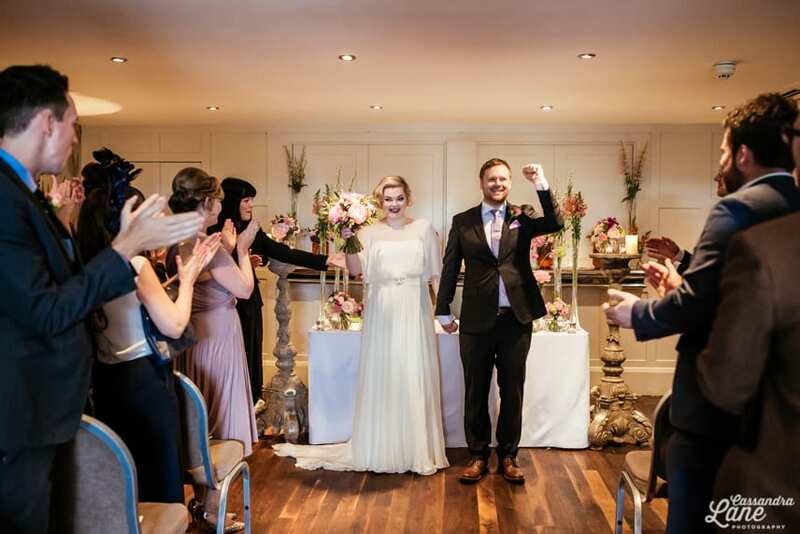 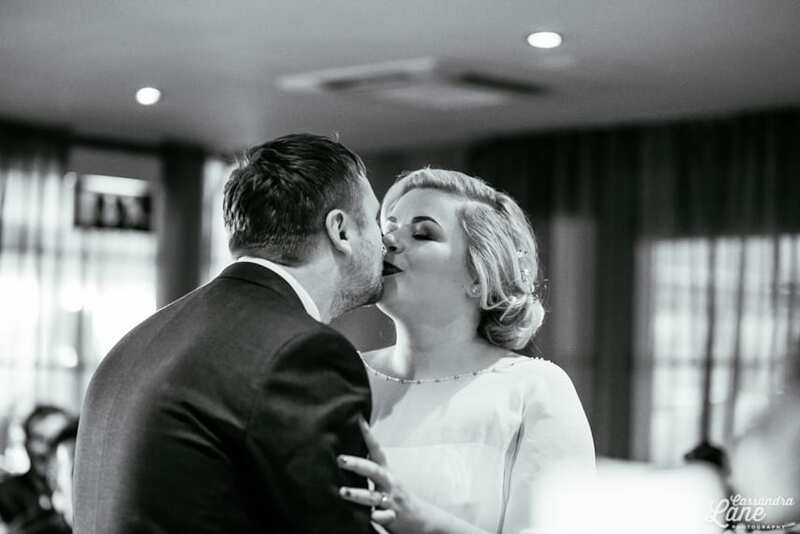 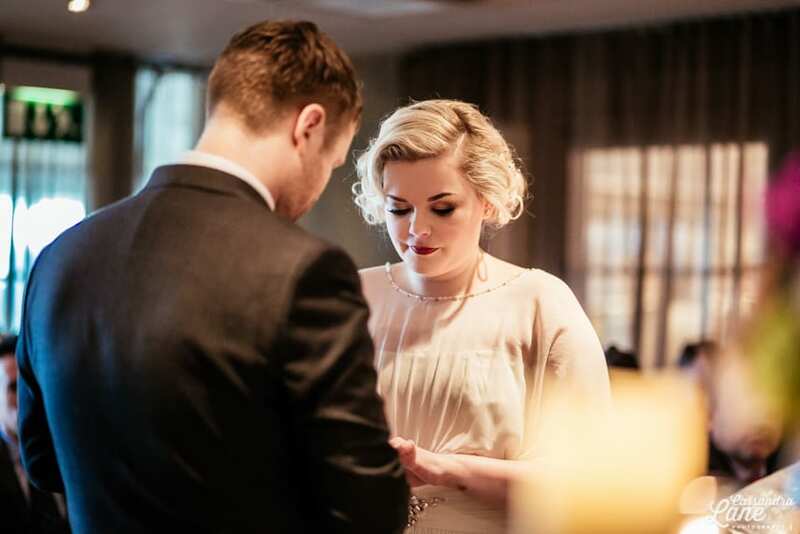 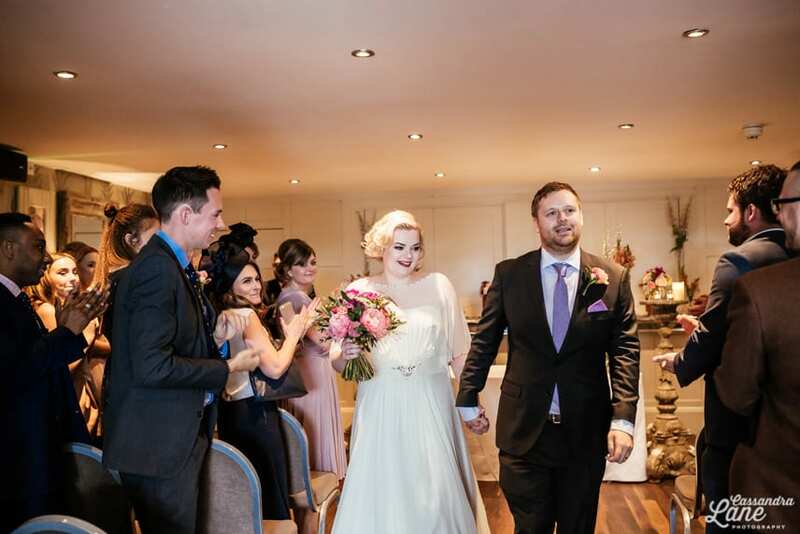 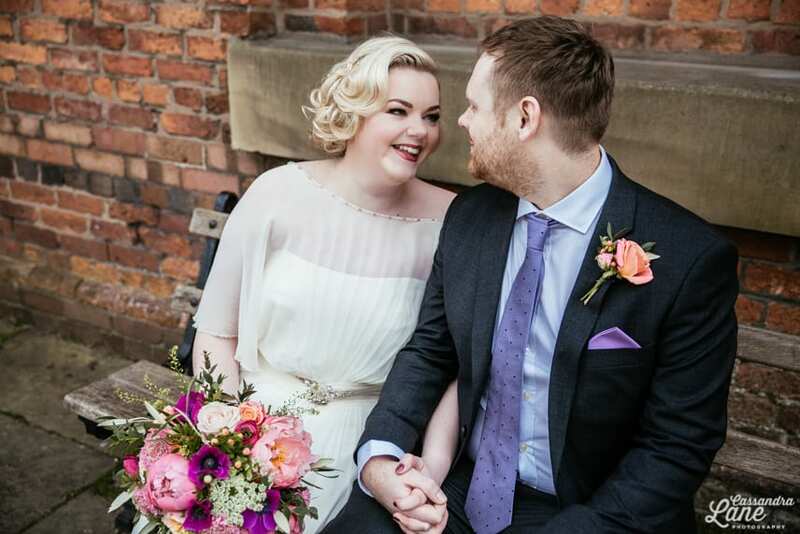 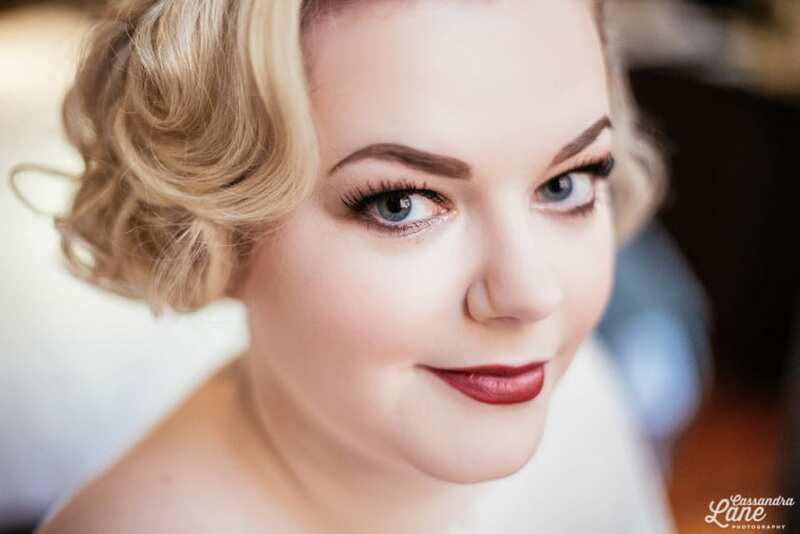 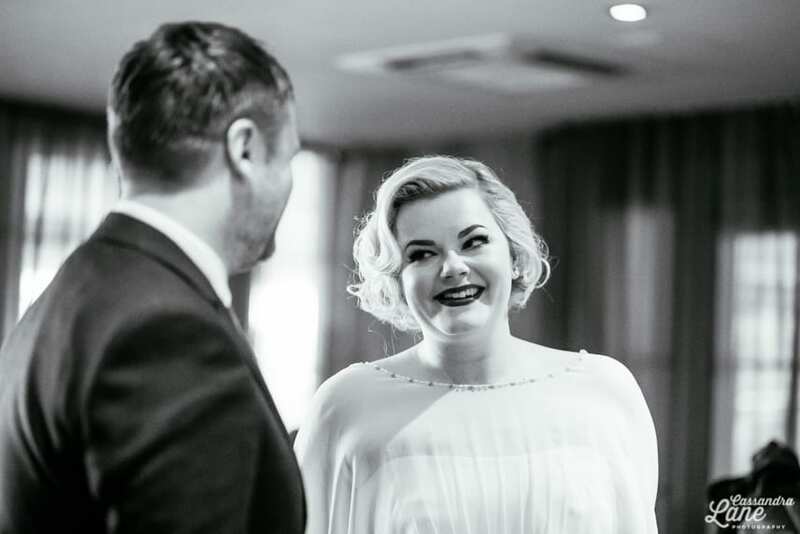 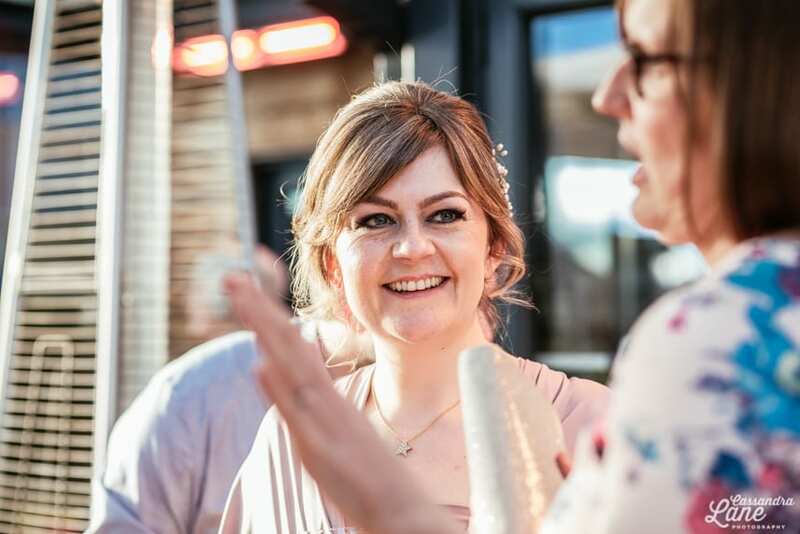 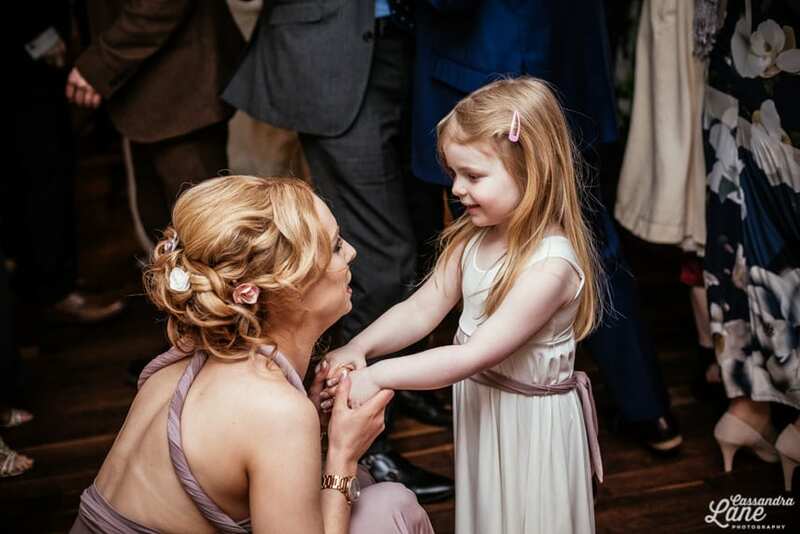 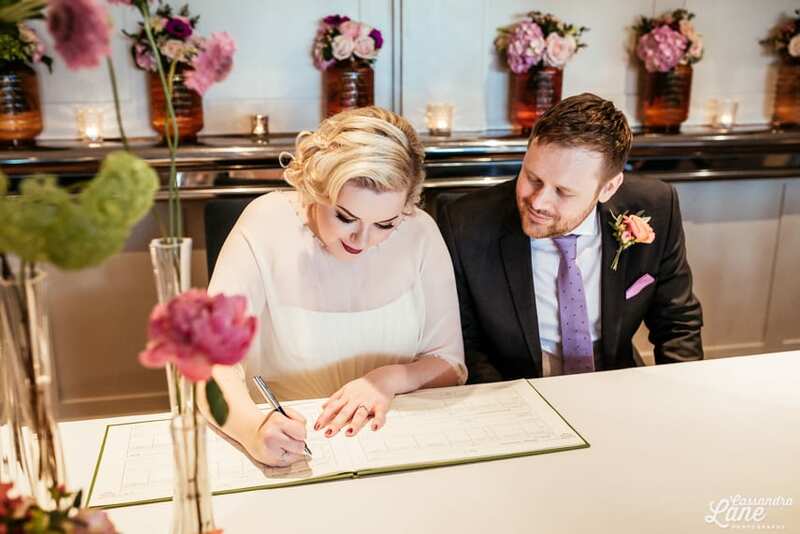 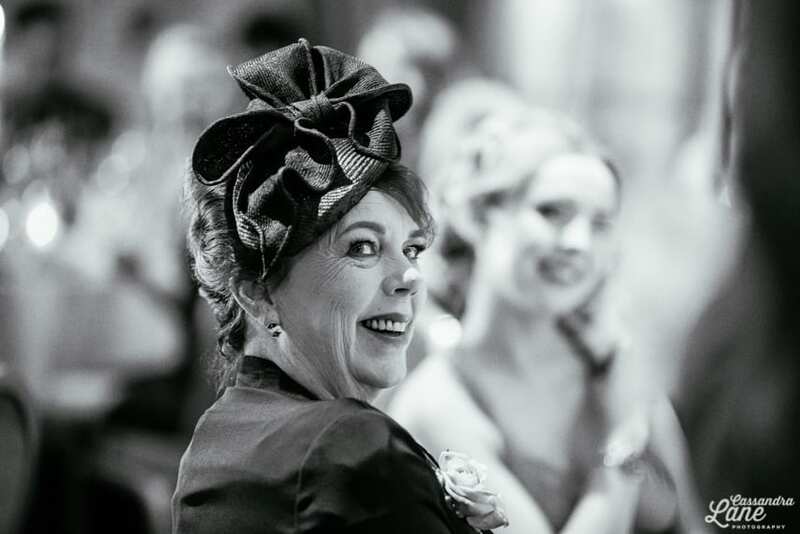 Daisy’s hair and make-up was done by Bethany Jane Davies, who created a stunning vintage Hollywood look that suited Daisy down to a tee and perfectly complimented her Jenny Packham dress from The White Closet. 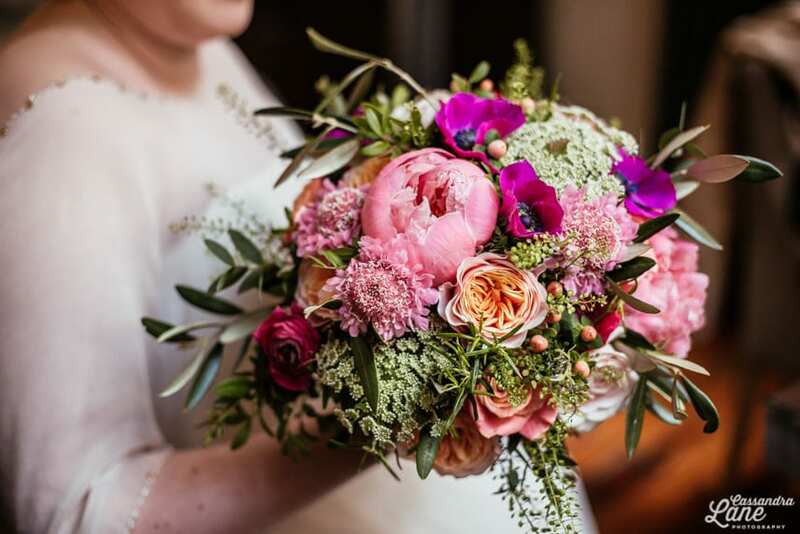 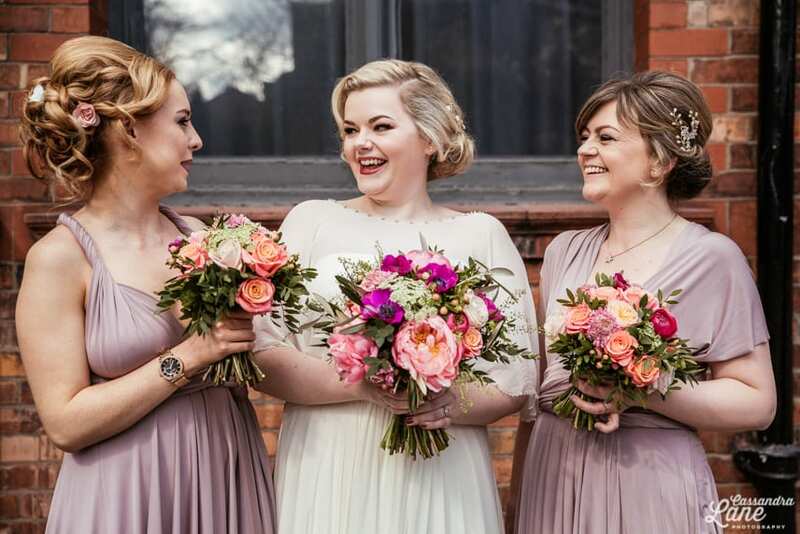 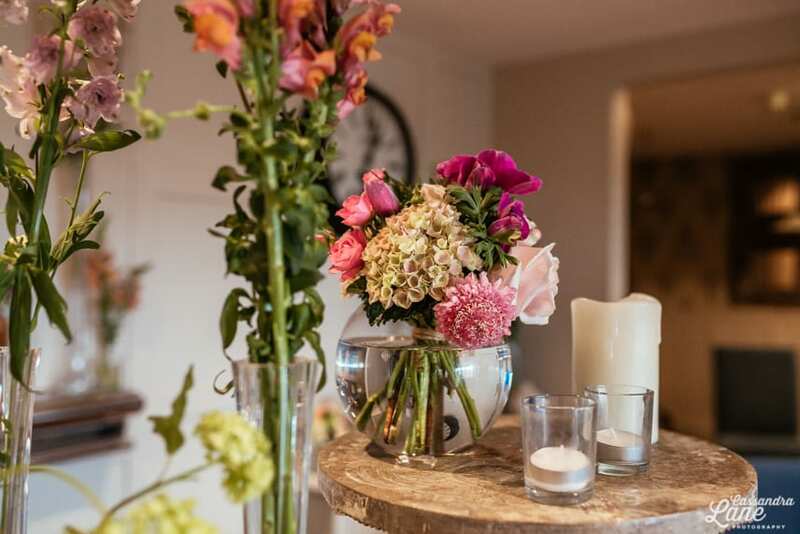 Daisy’s bridesmaids wore Two Birds dresses and the girls carried colourful bouquets by David at Frog Flowers, whilst Daisy’s bridesman and Marc’s crew sported matching buttonholes. 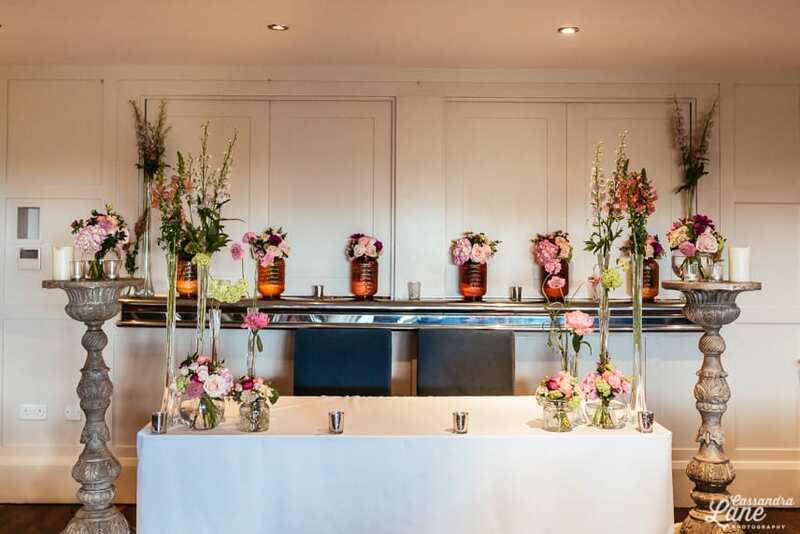 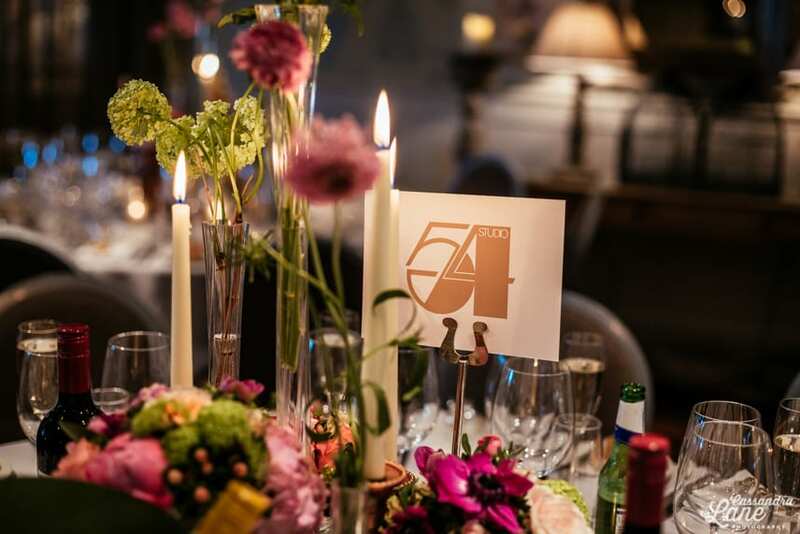 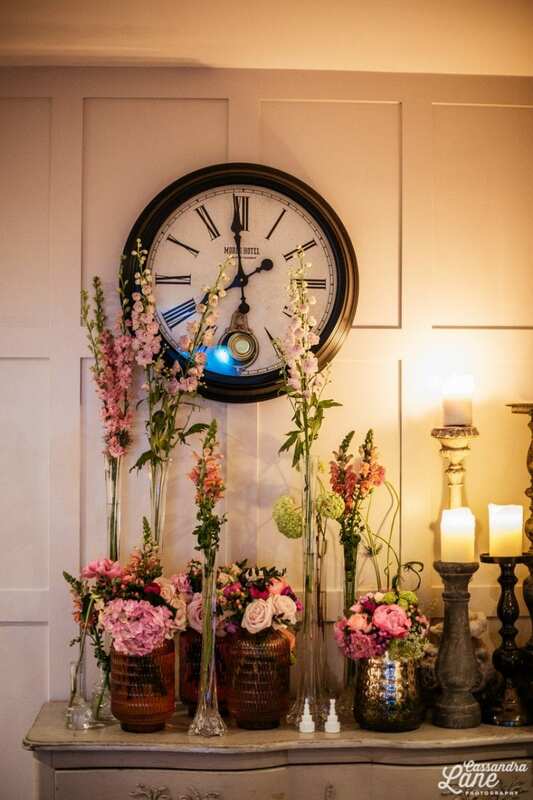 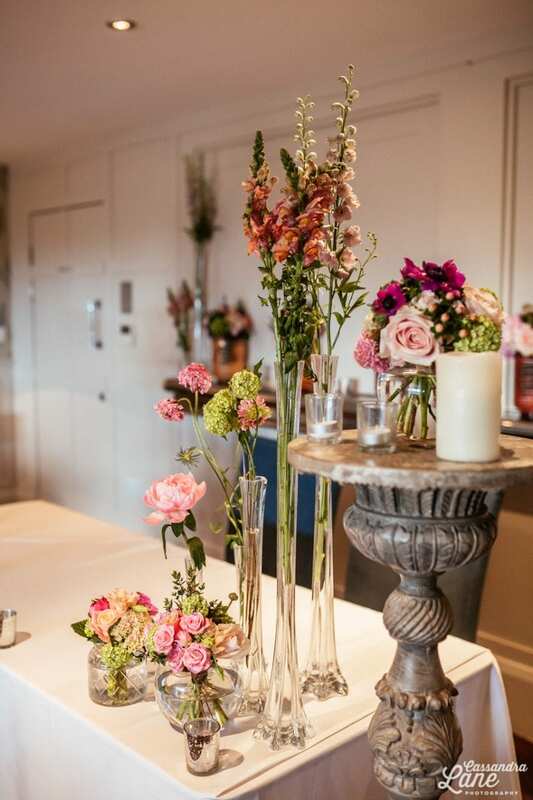 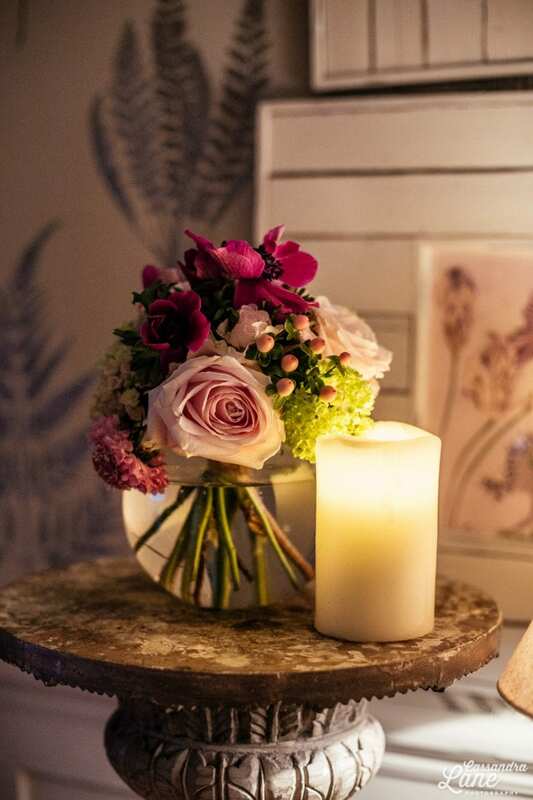 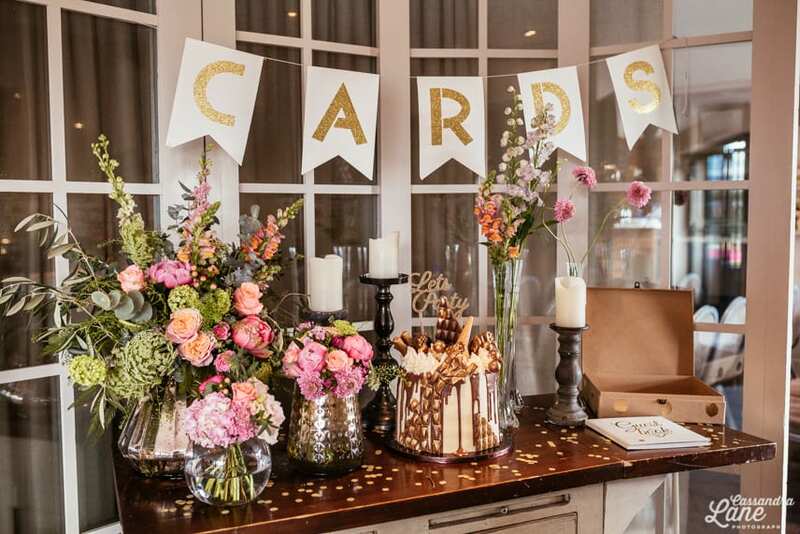 Frog Flowers had also beautifully decorated the ceremony room at Great John St. with wild, colourful blooms. 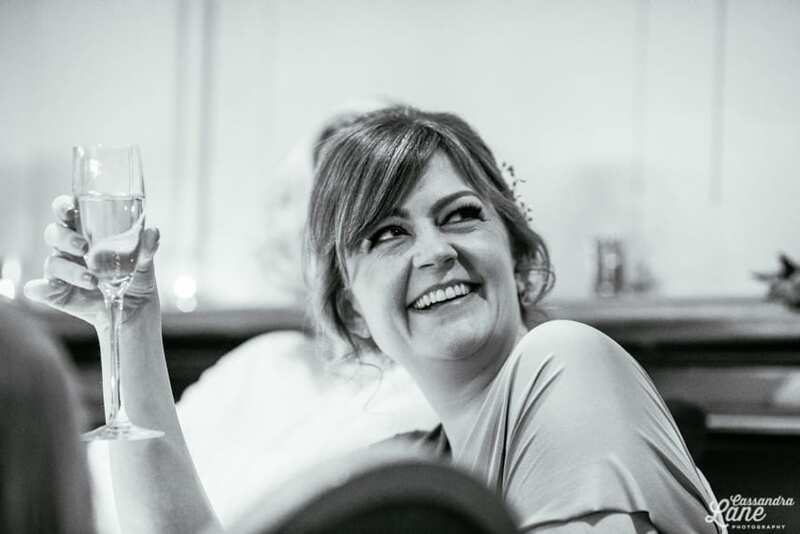 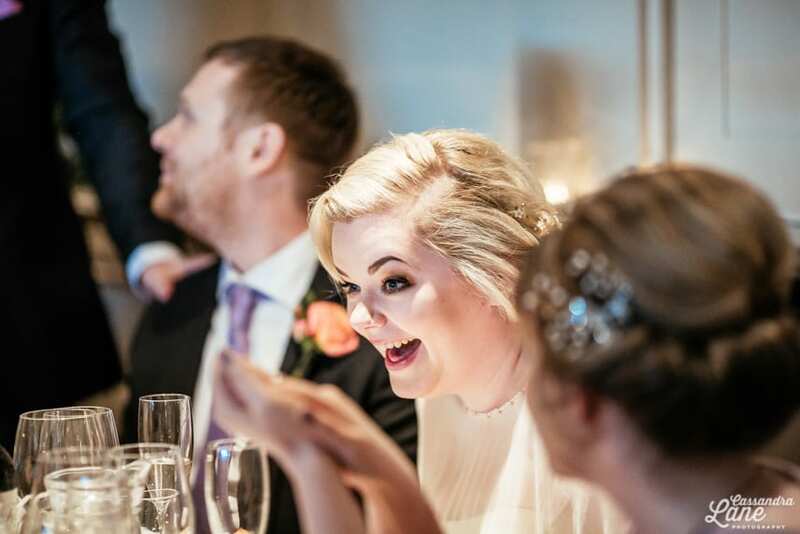 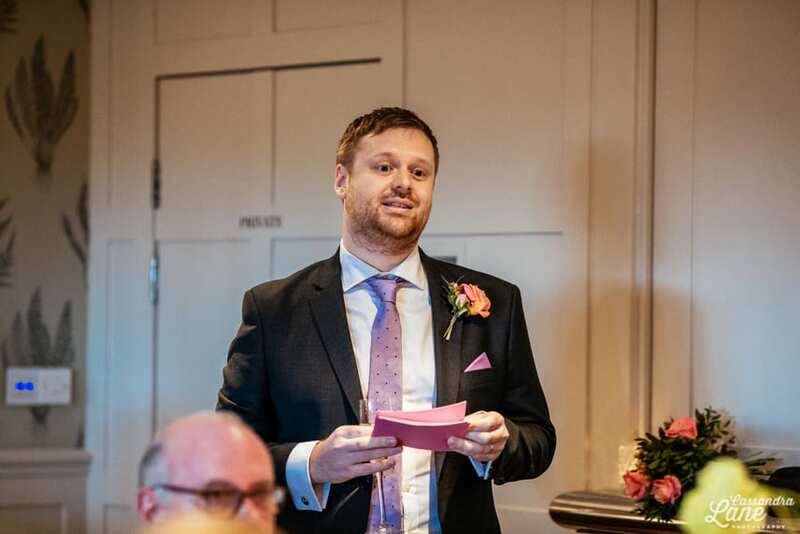 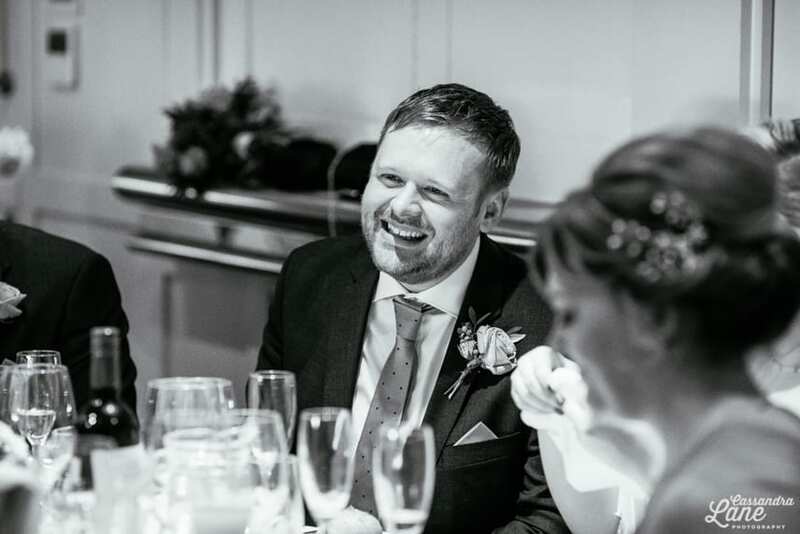 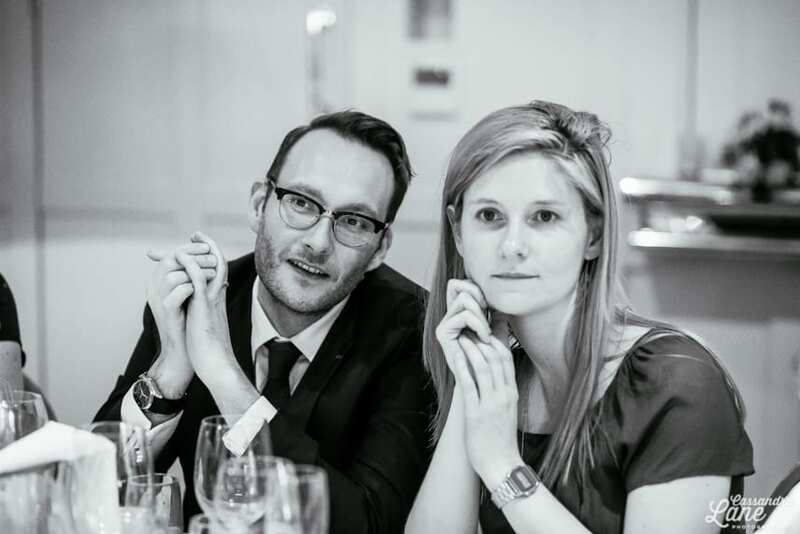 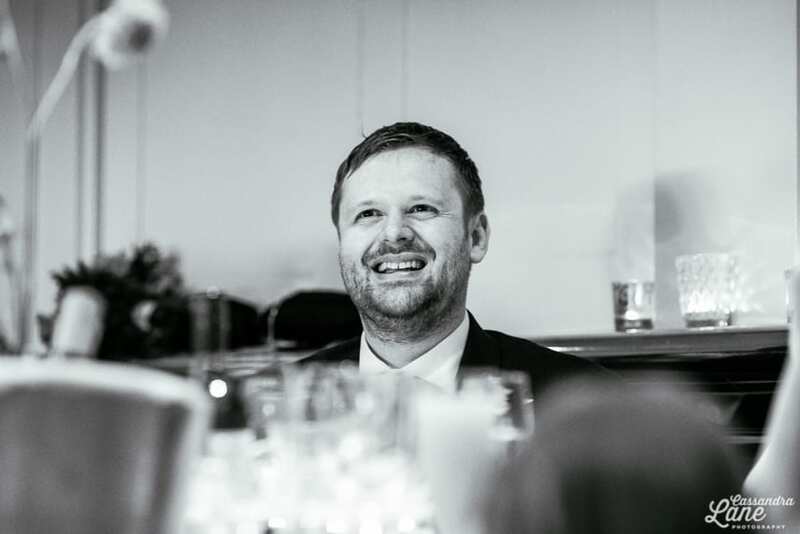 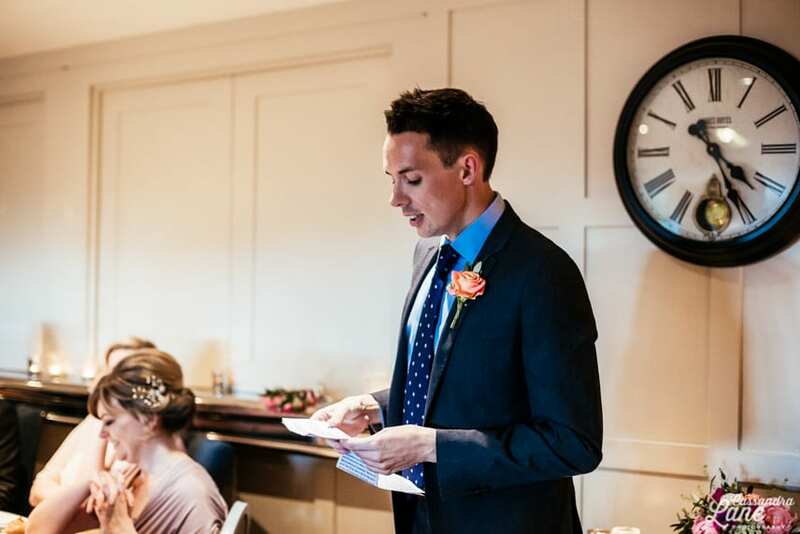 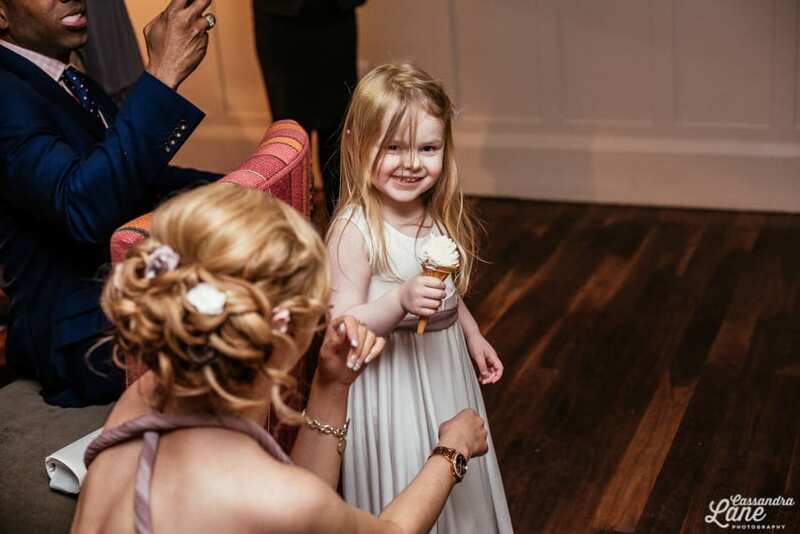 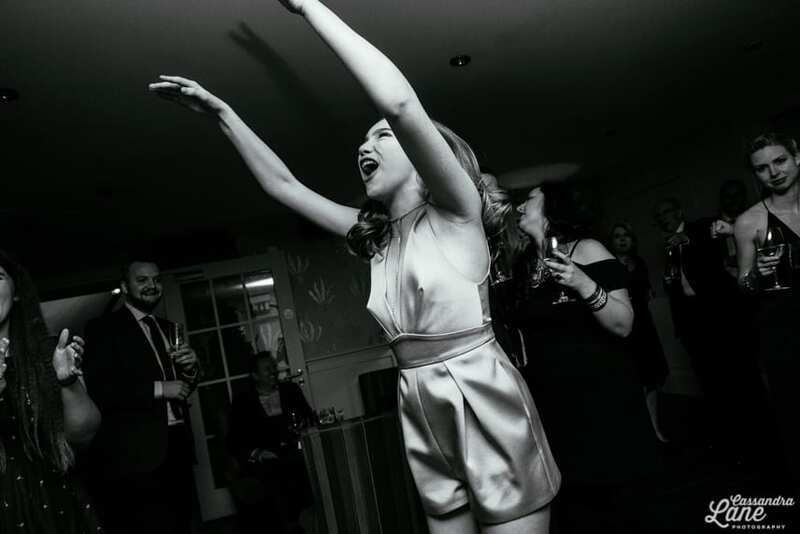 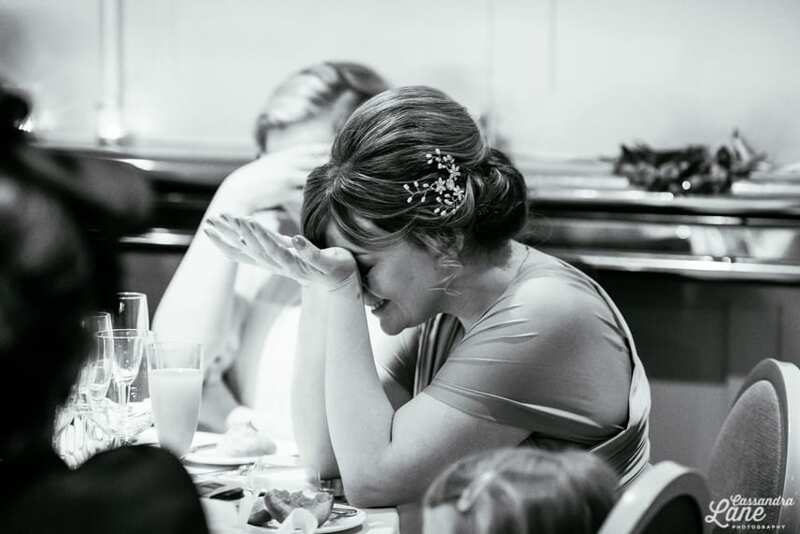 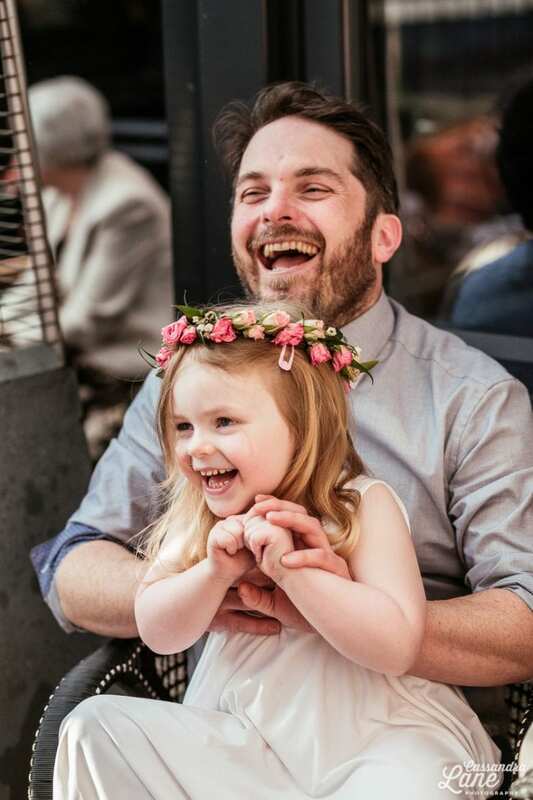 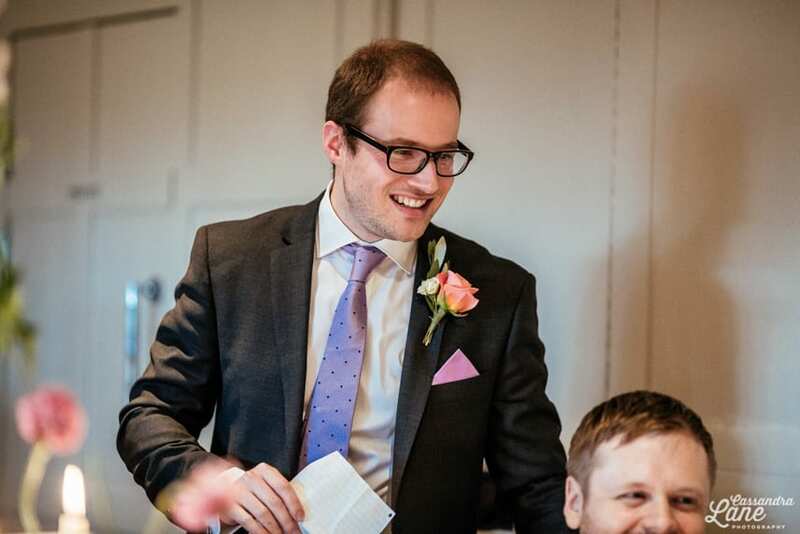 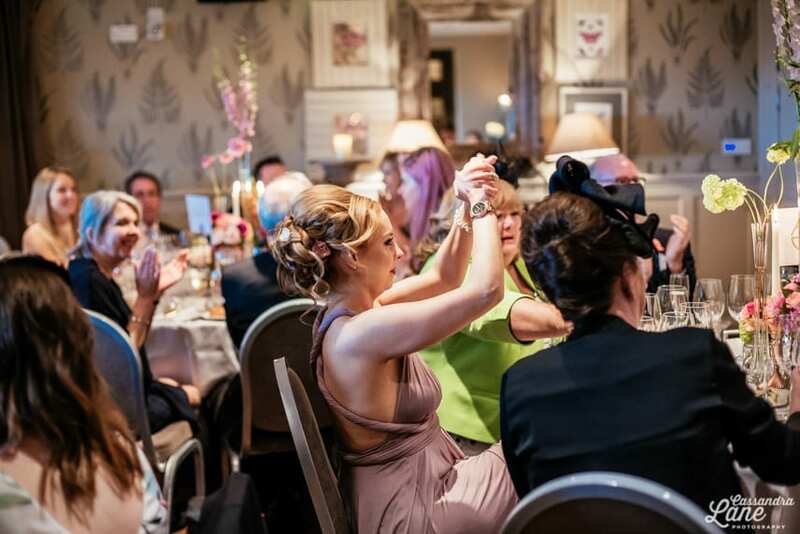 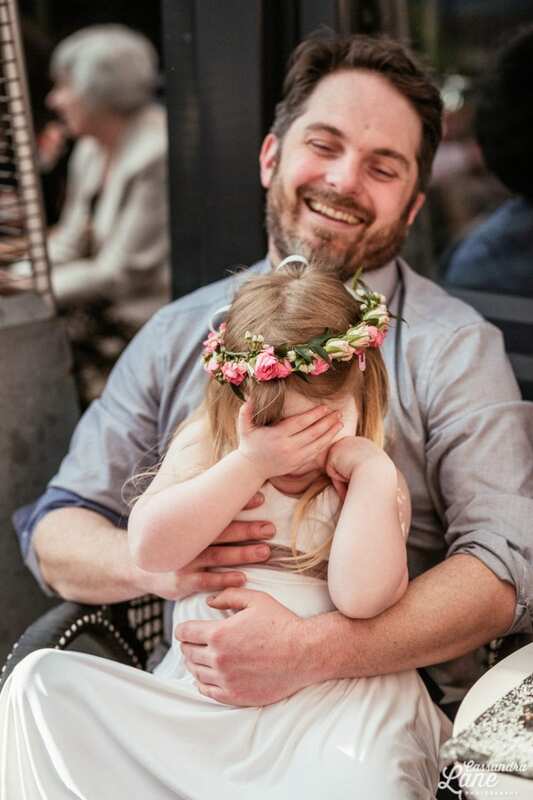 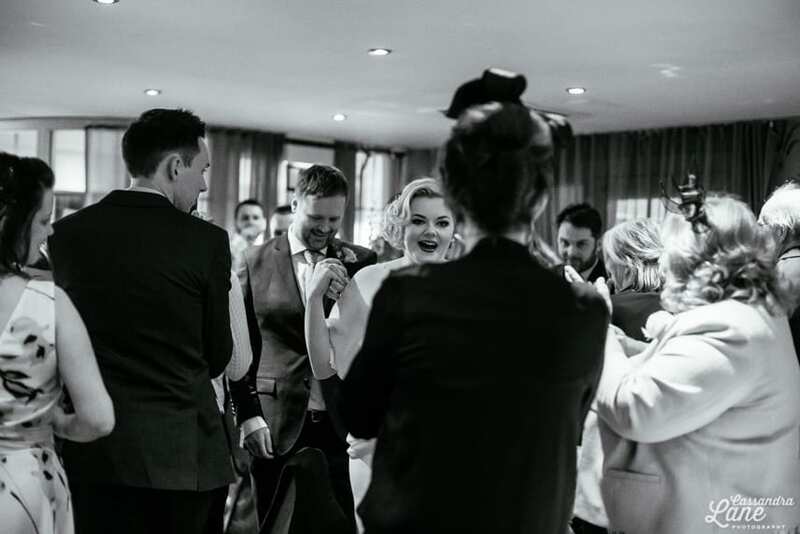 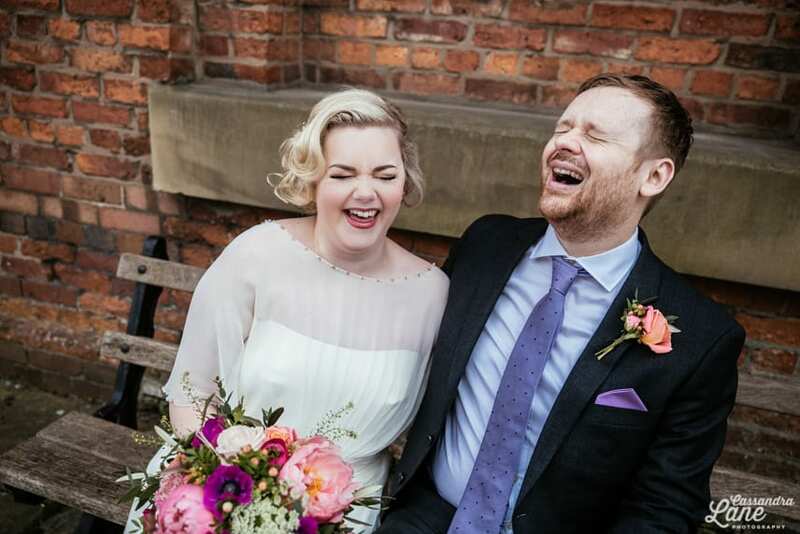 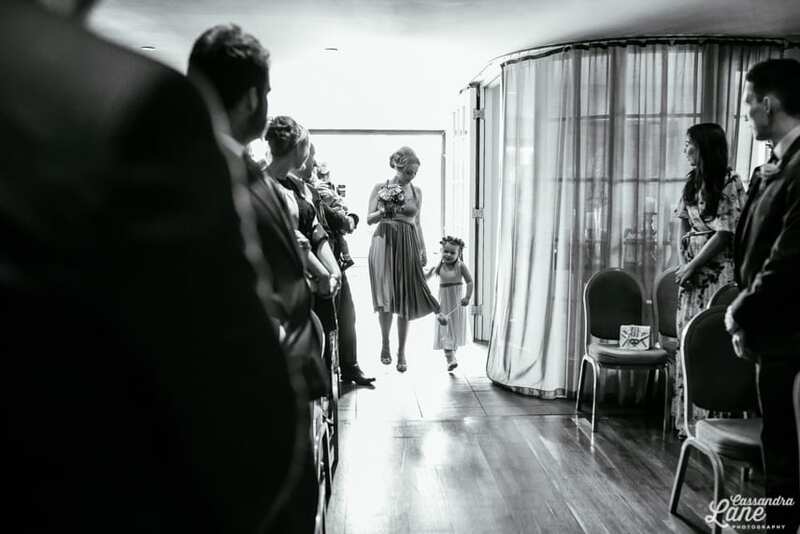 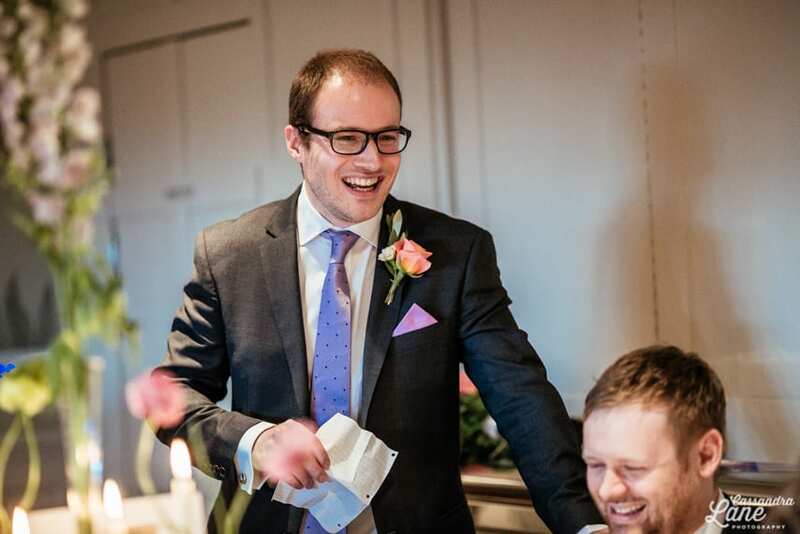 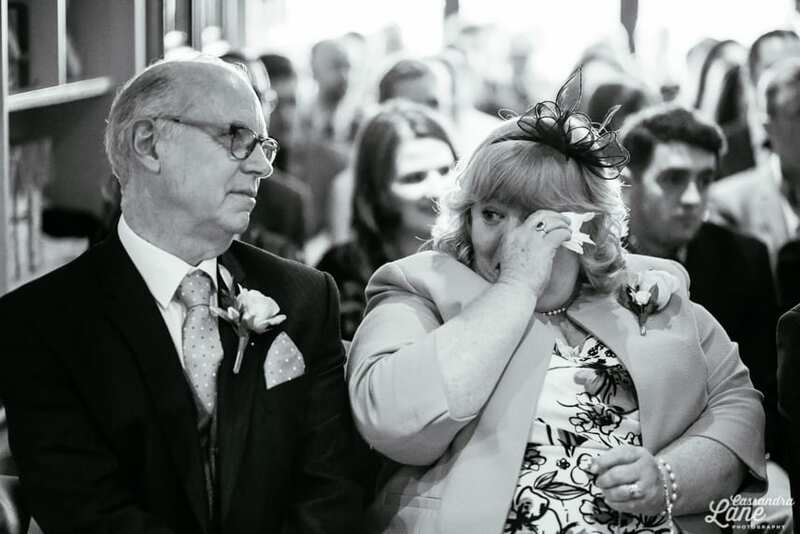 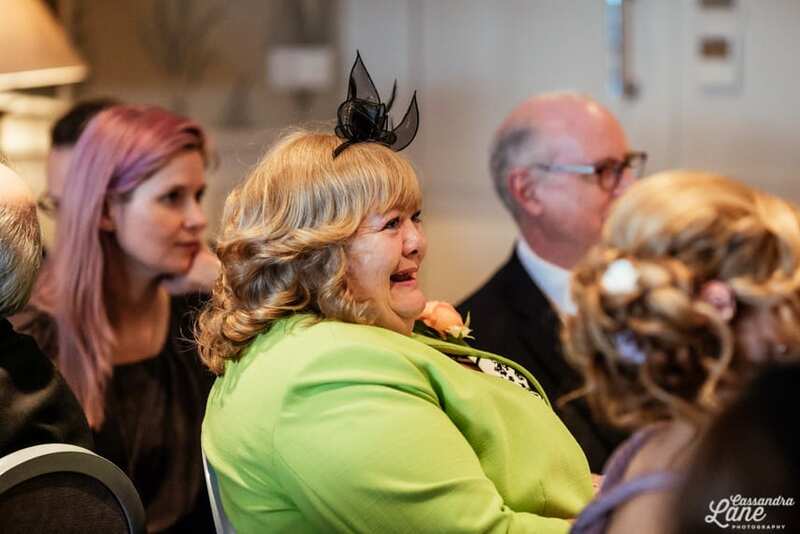 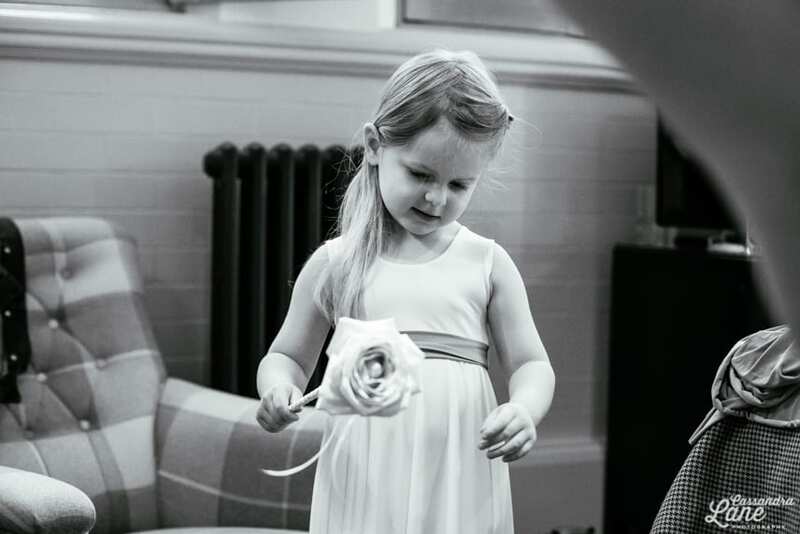 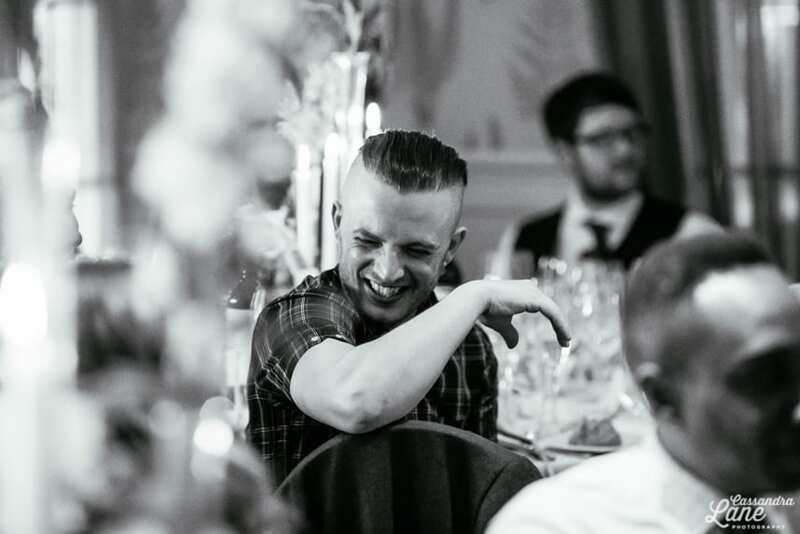 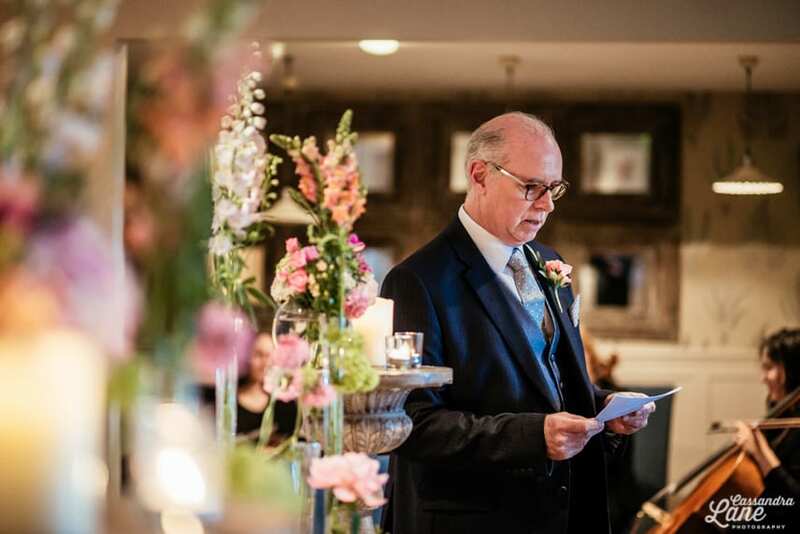 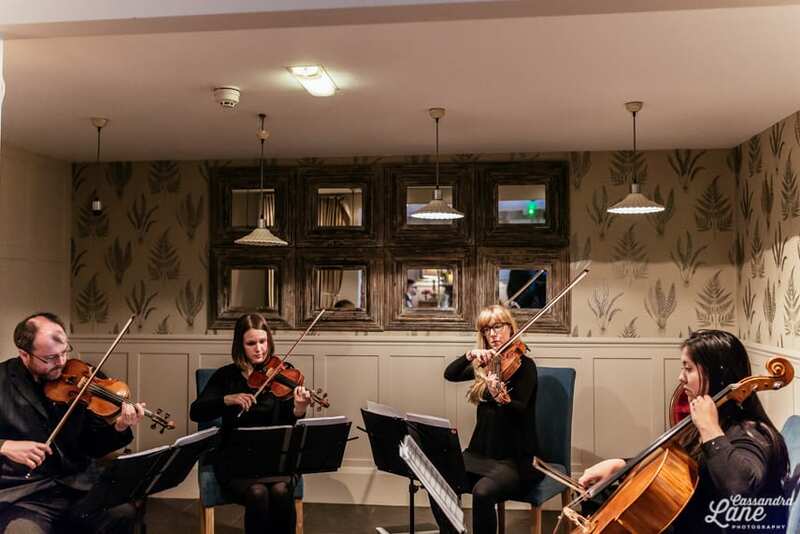 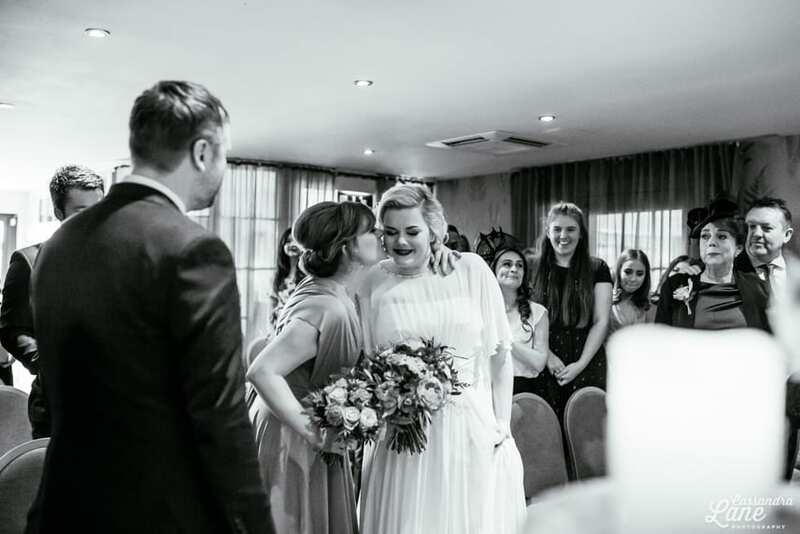 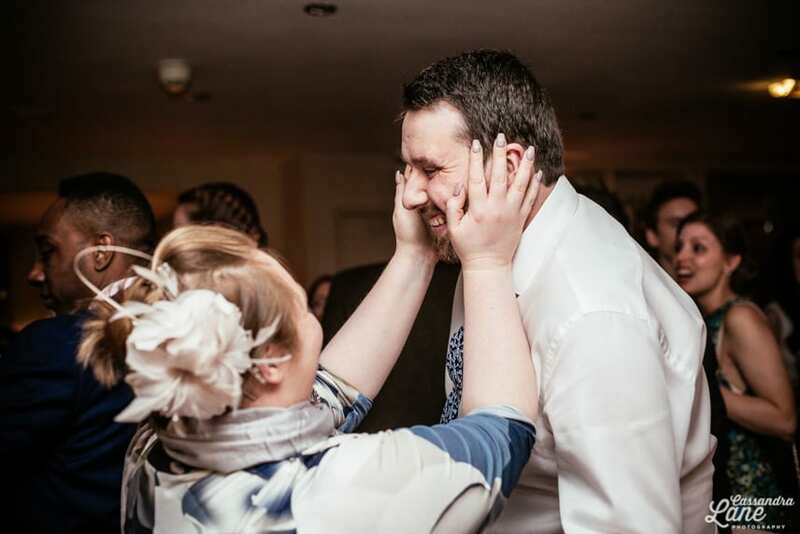 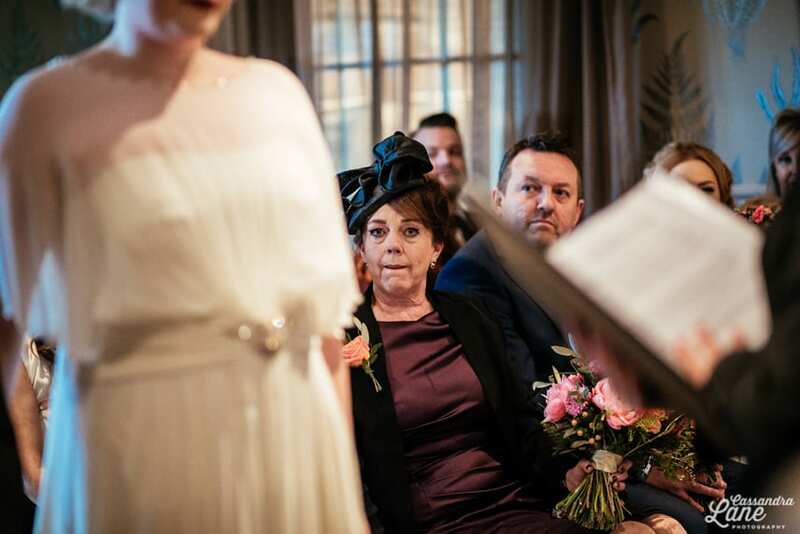 When it was time for Daisy to walk down the aisle with her sister, Manchester String Quartet began to play and I spotted a fair few tears around the room! 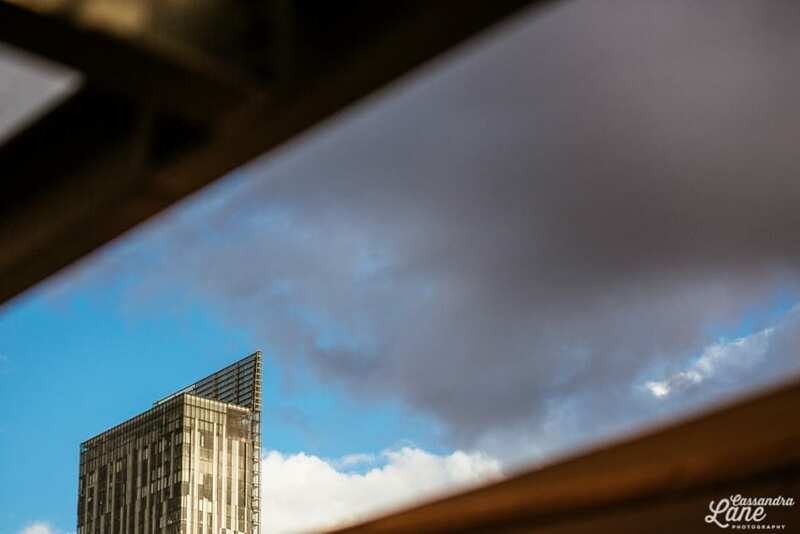 One of the best parts of shooting in the city is being able to use the urban surroundings. 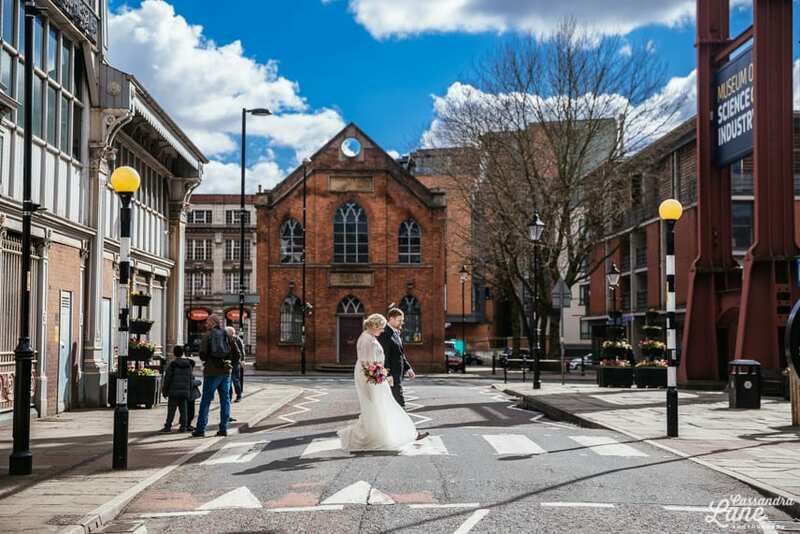 My favourite shot from the day is the one above of Daisy & Marc walking over the zebra crossing outside the Museum of Science and Industry. 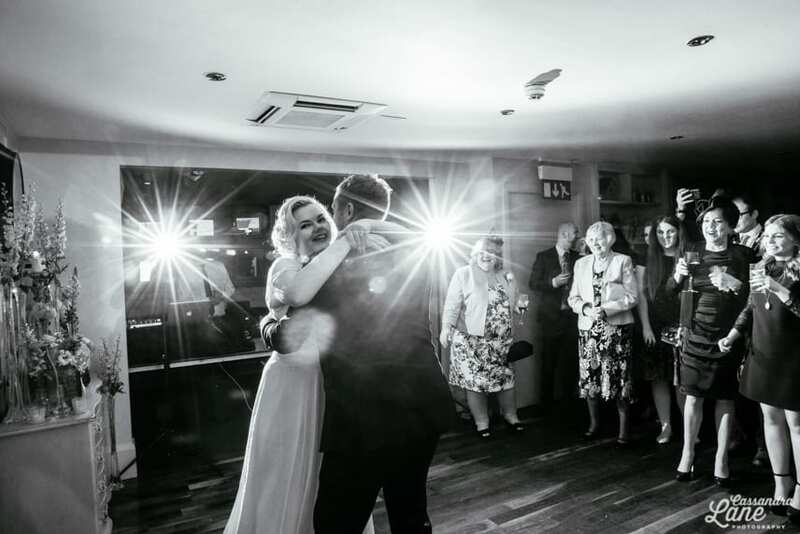 The light was just hitting them at the right angle and illuminating them perfectly as they crossed. 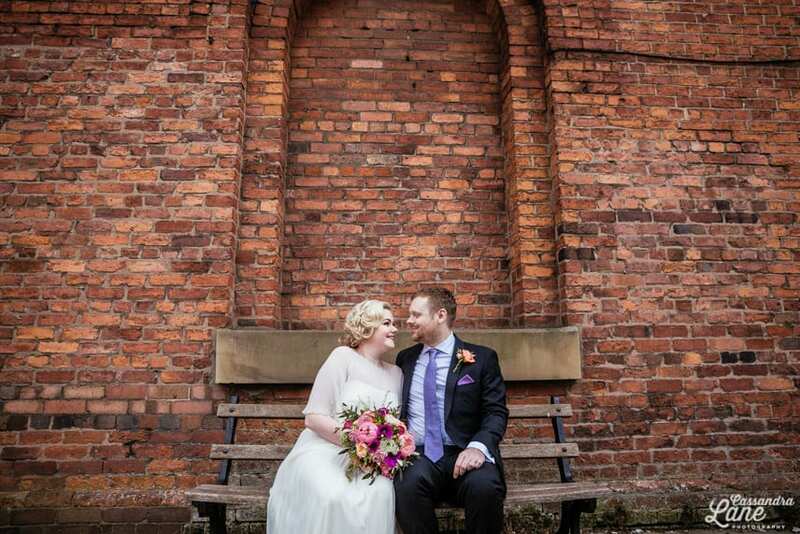 The area around Great John St. also has some pretty cracking walls, for all you brick enthusiasts out there! 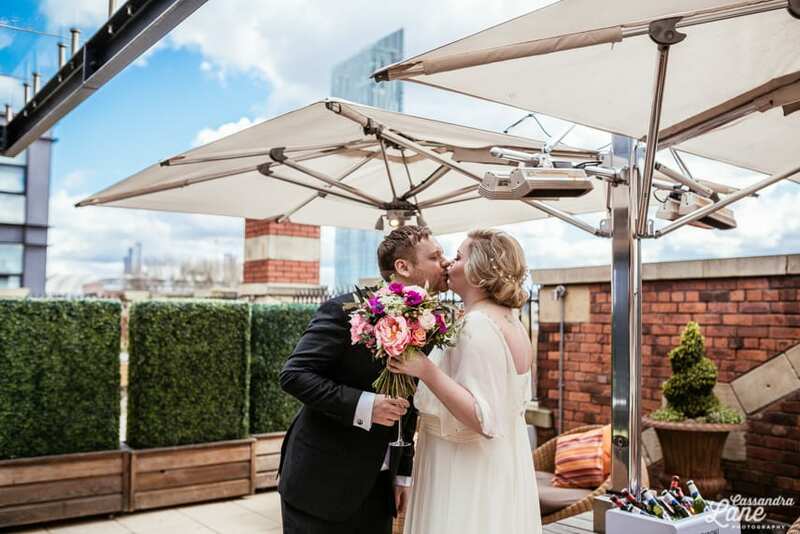 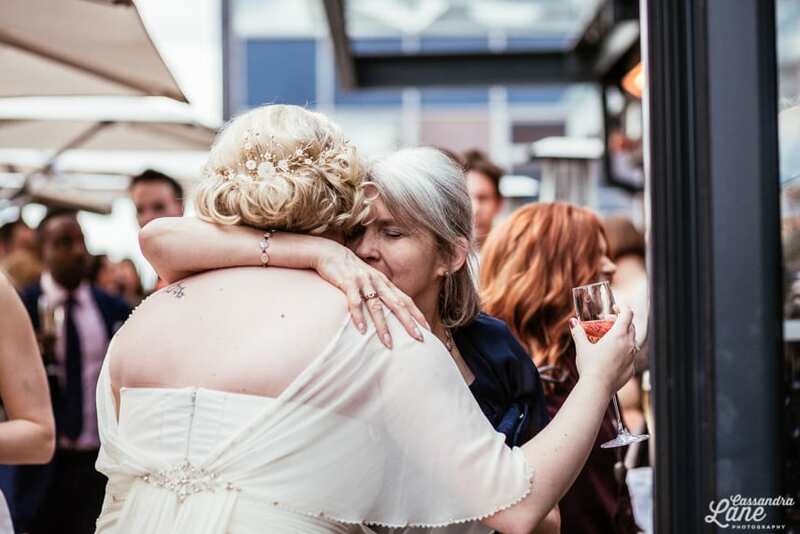 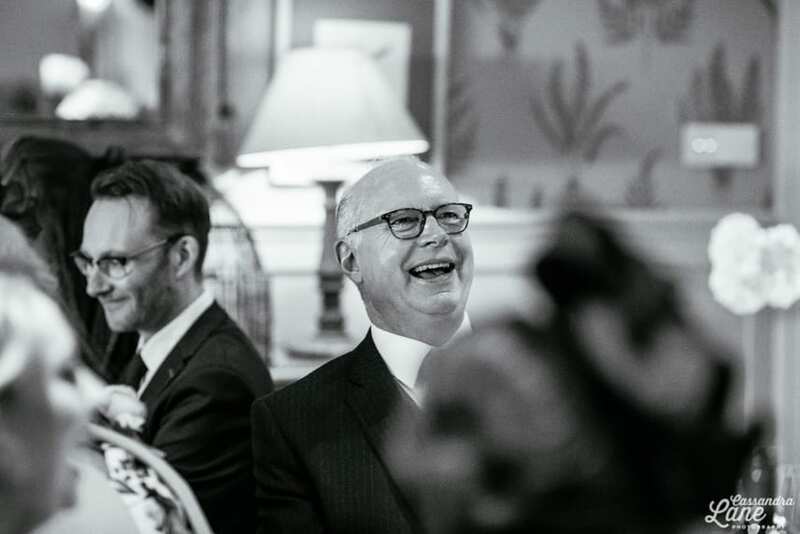 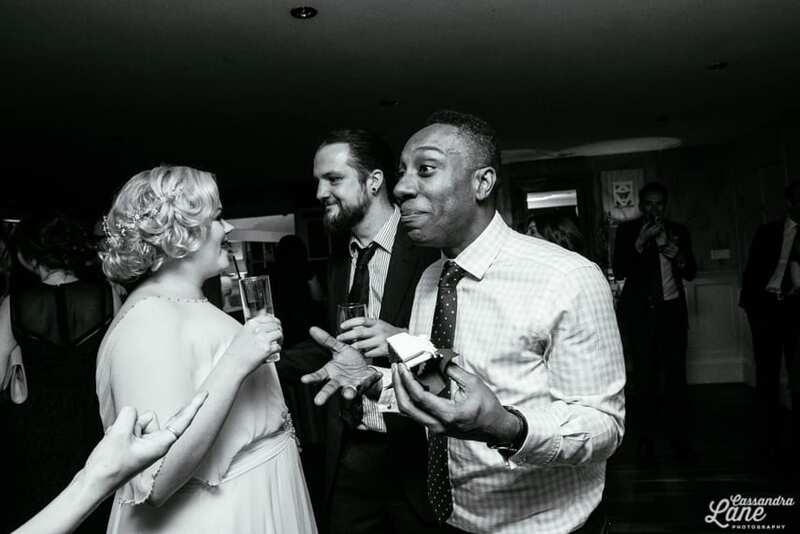 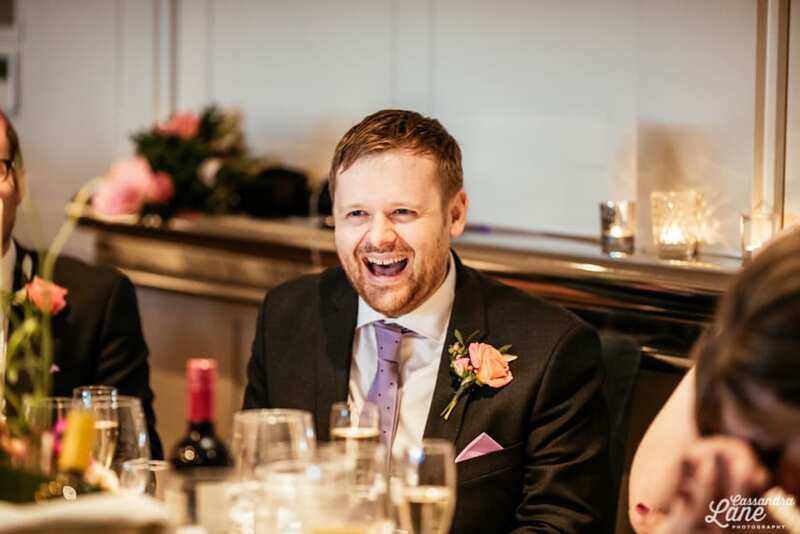 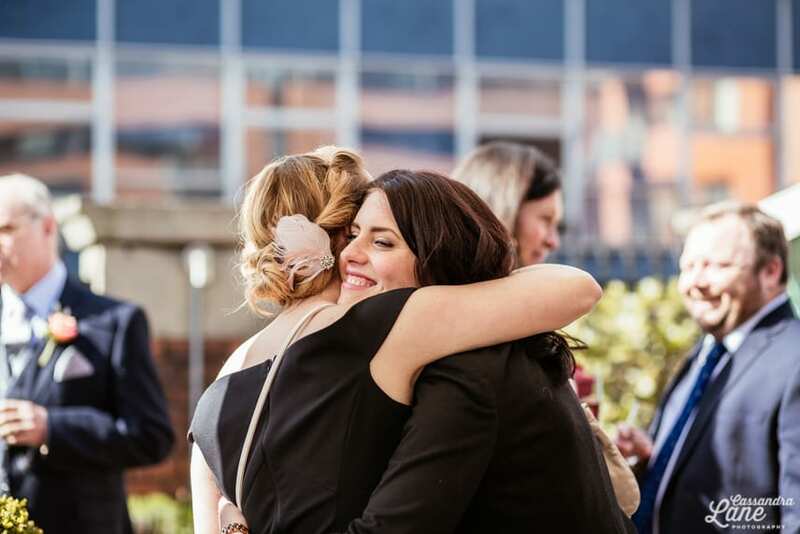 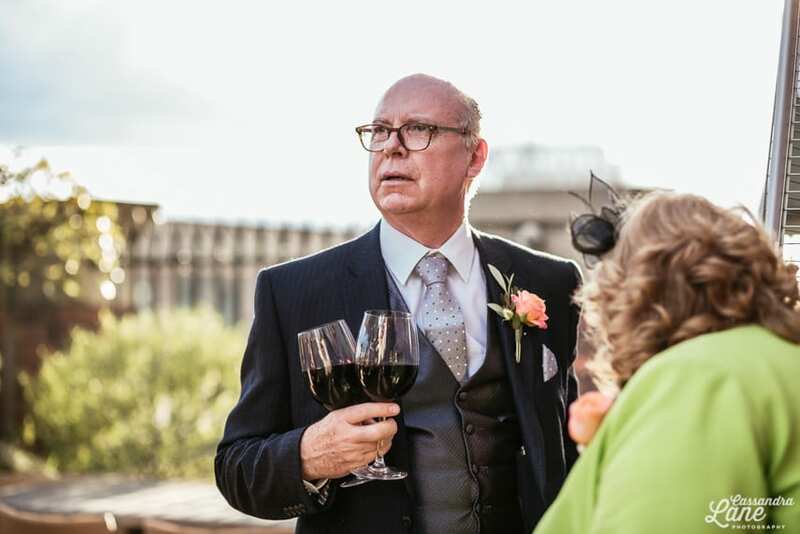 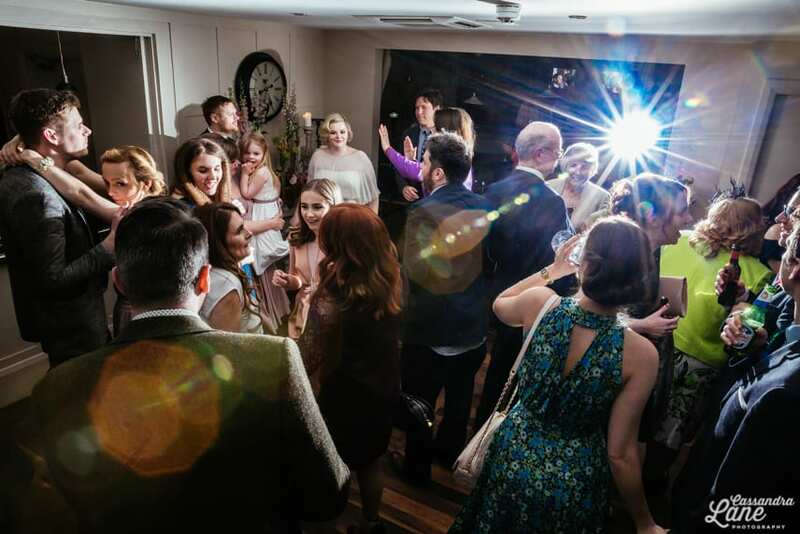 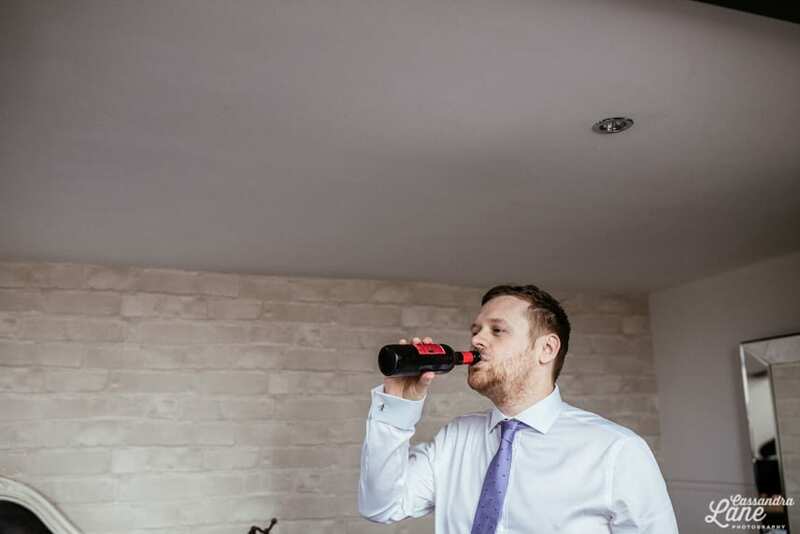 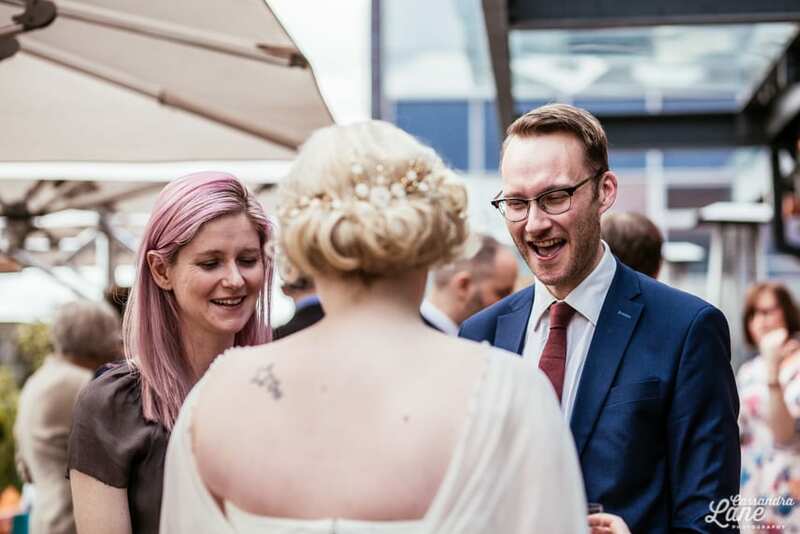 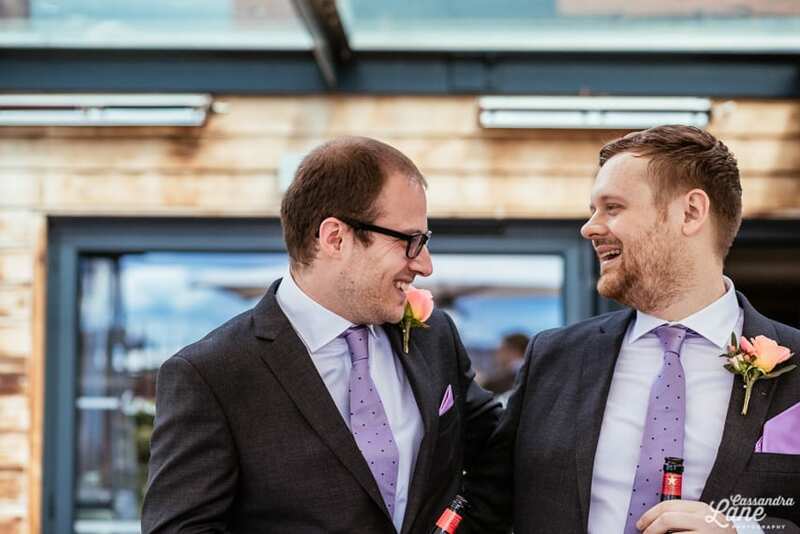 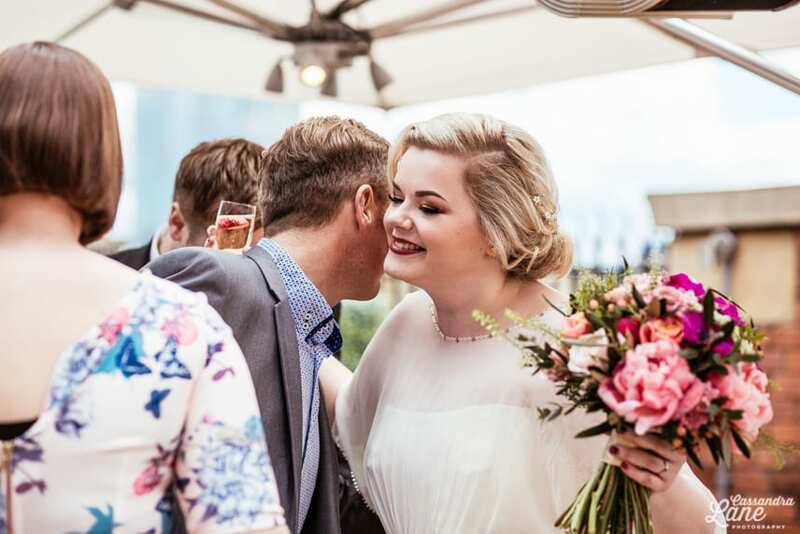 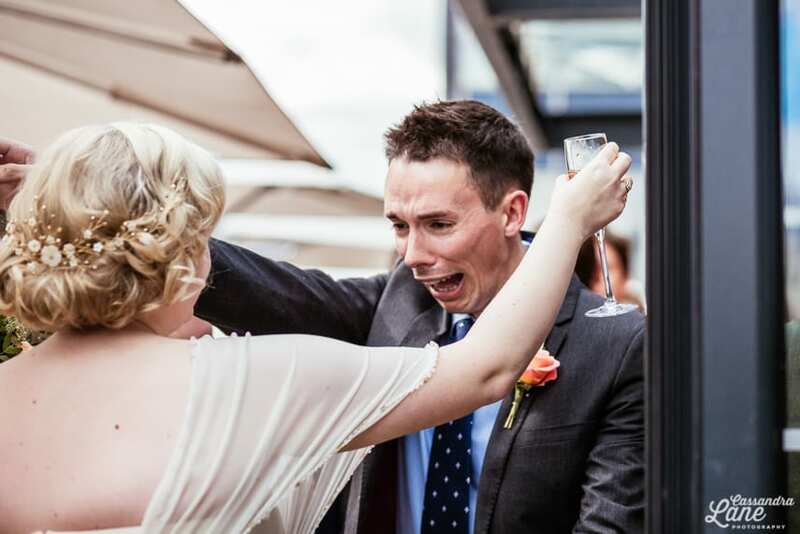 When we returned to Daisy & Marc’s reception after photos, their guests were hanging out on the terrace and enjoying their drinks in the spring sunshine. 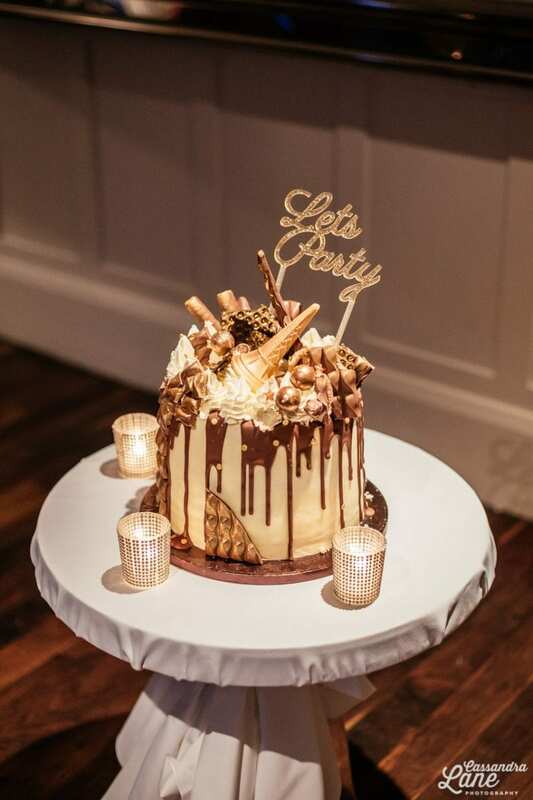 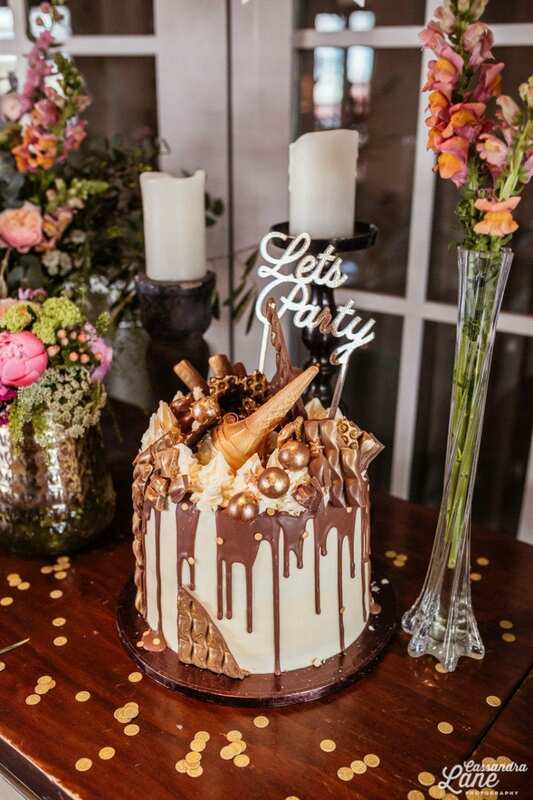 Only the amazing cake from Bakeorama in Chrolton could tempt them inside – an impressive creation that tasted as good as it looked! 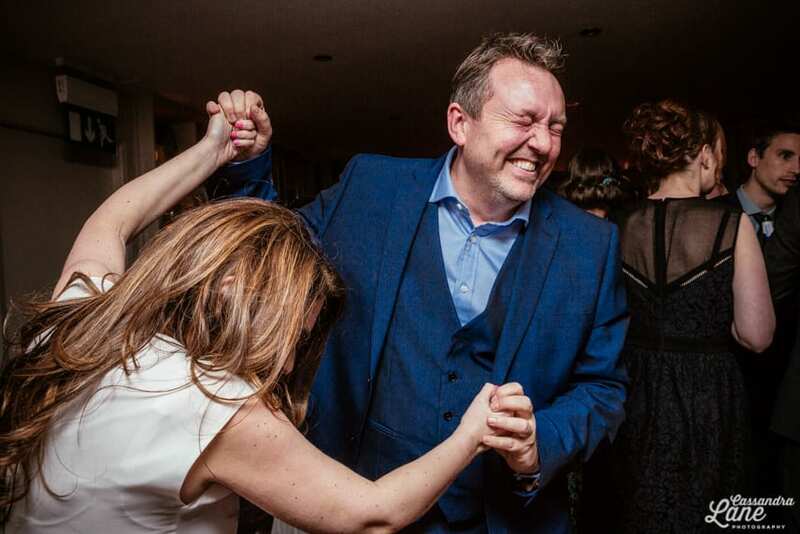 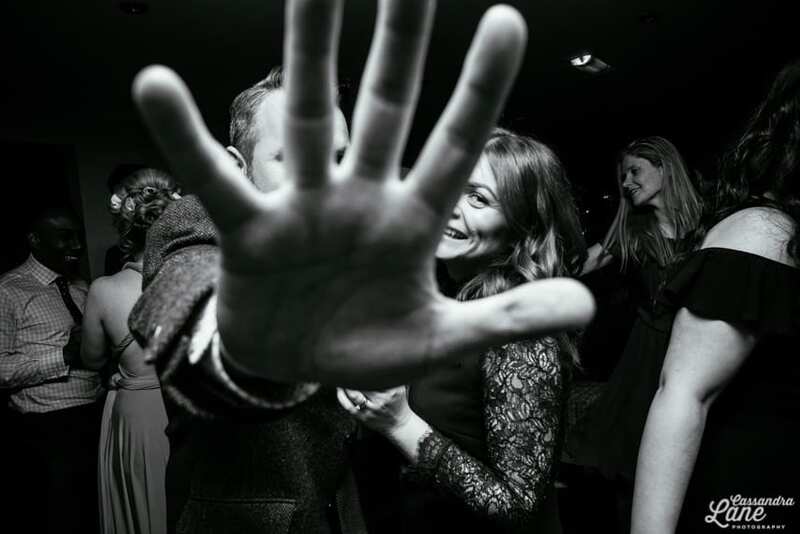 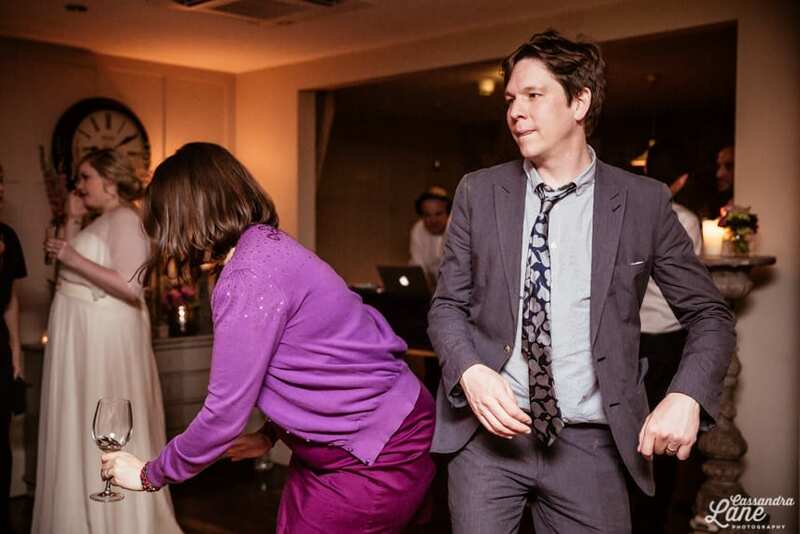 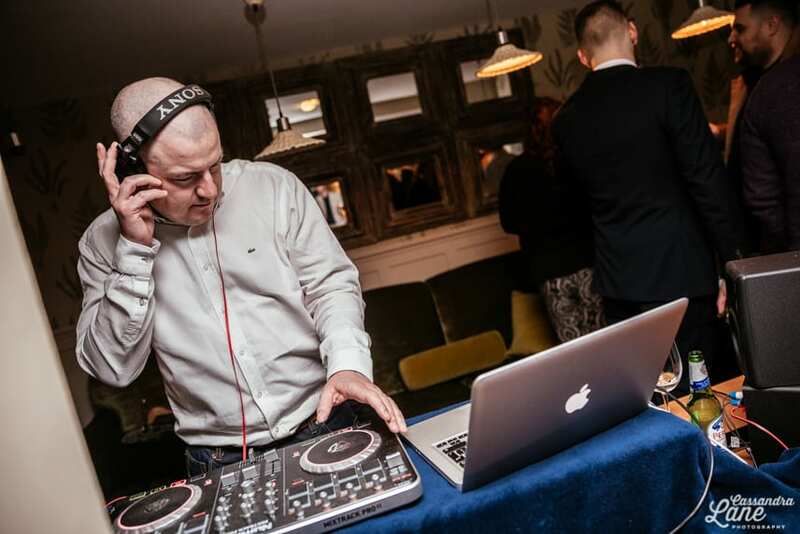 Then it was time to dance, dance, dance with Daisy & Marc’s friends on DJ duty. 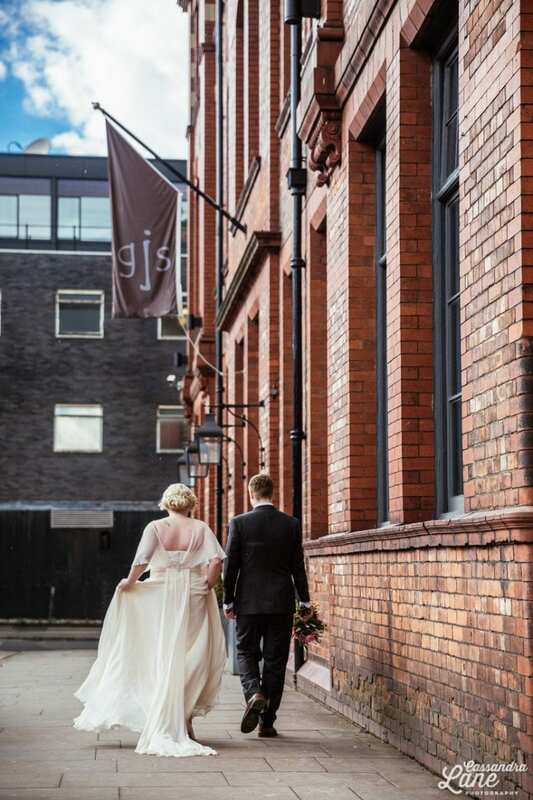 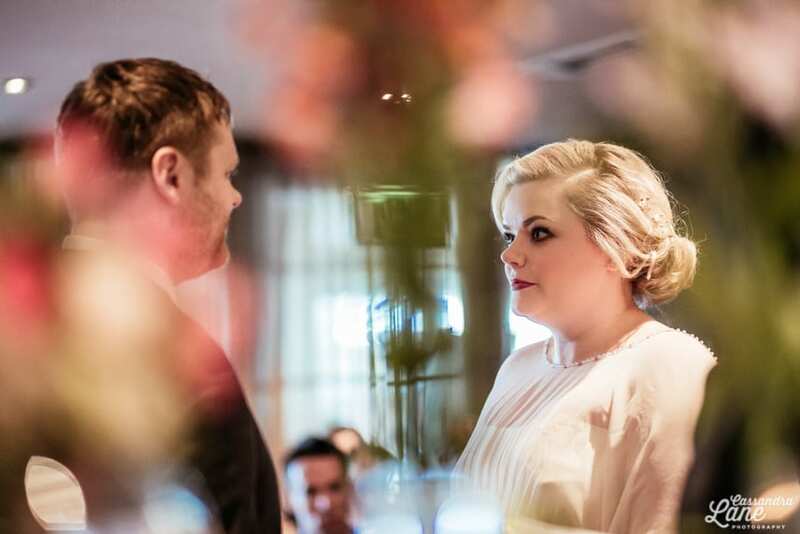 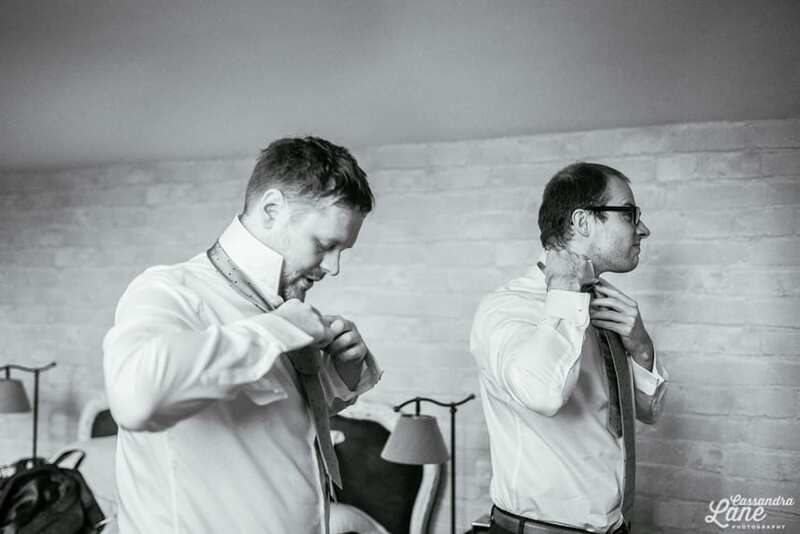 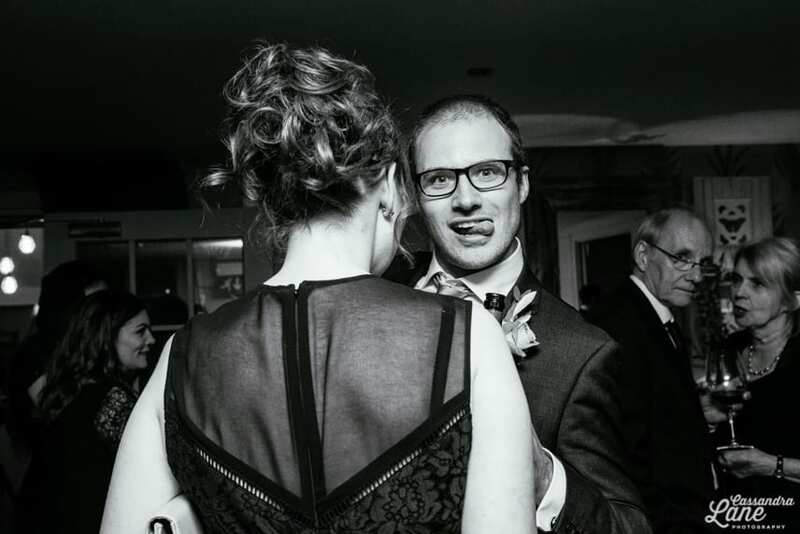 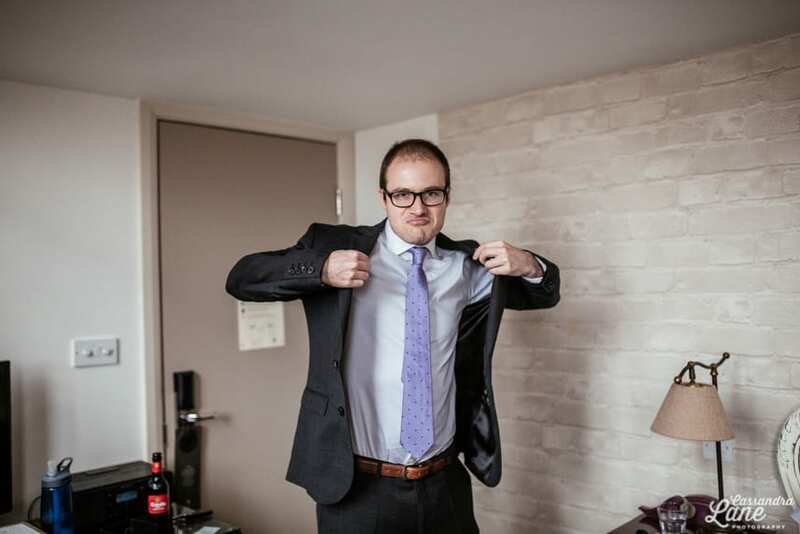 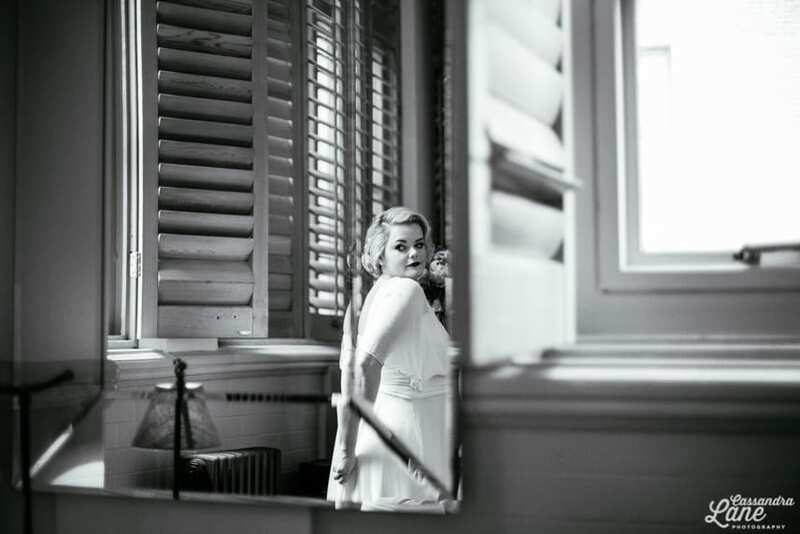 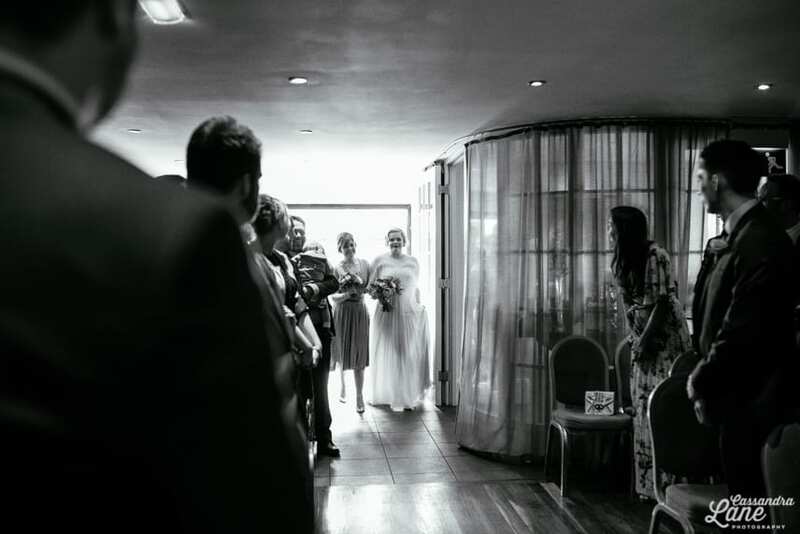 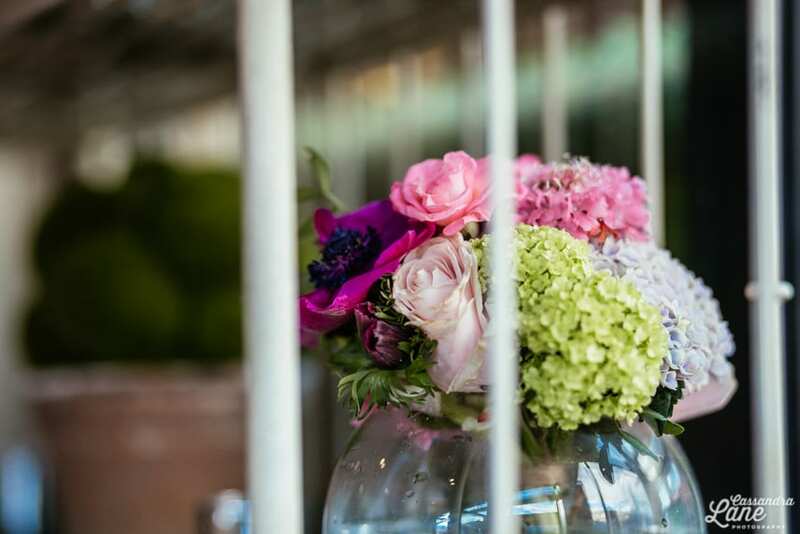 Vintage Wedding Photography Great John St. Hotel by Cassandra Lane. 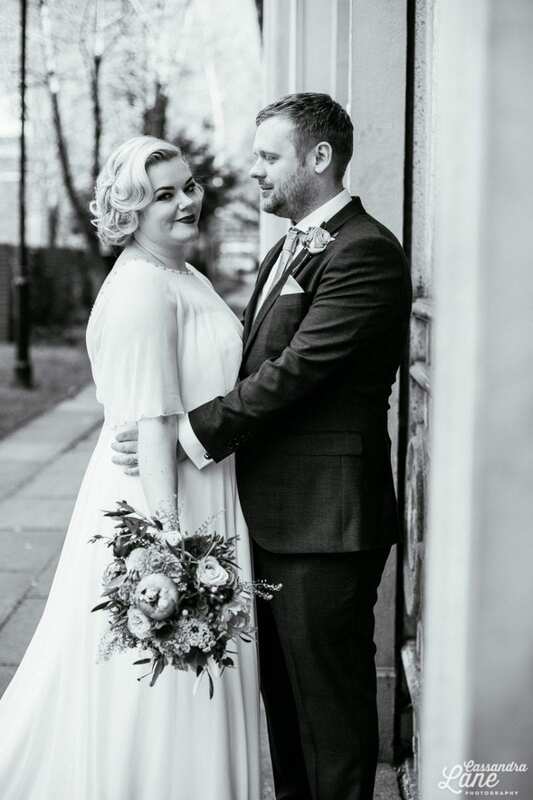 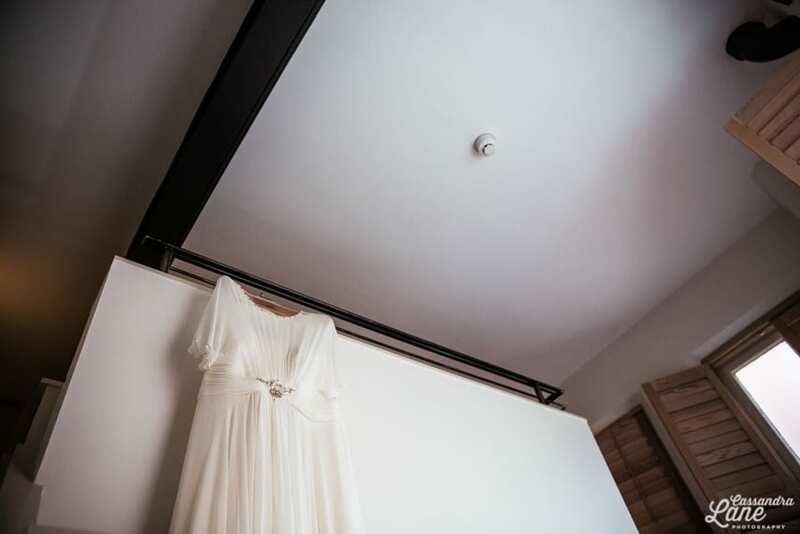 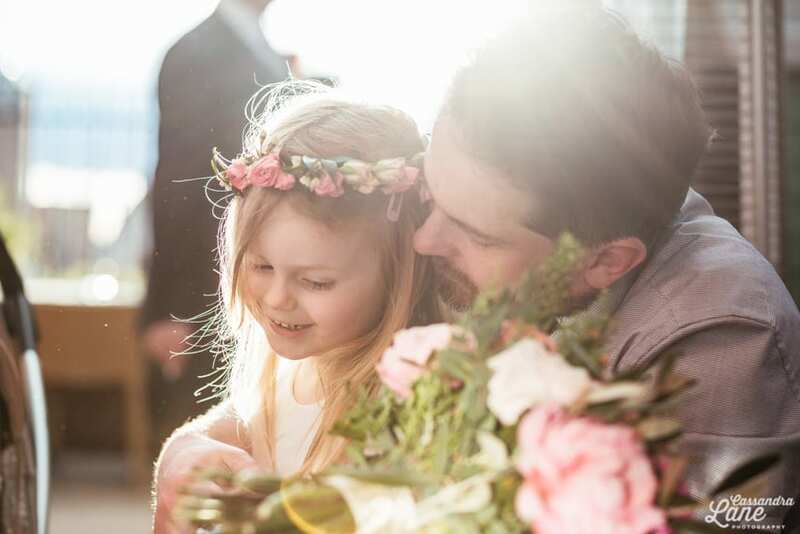 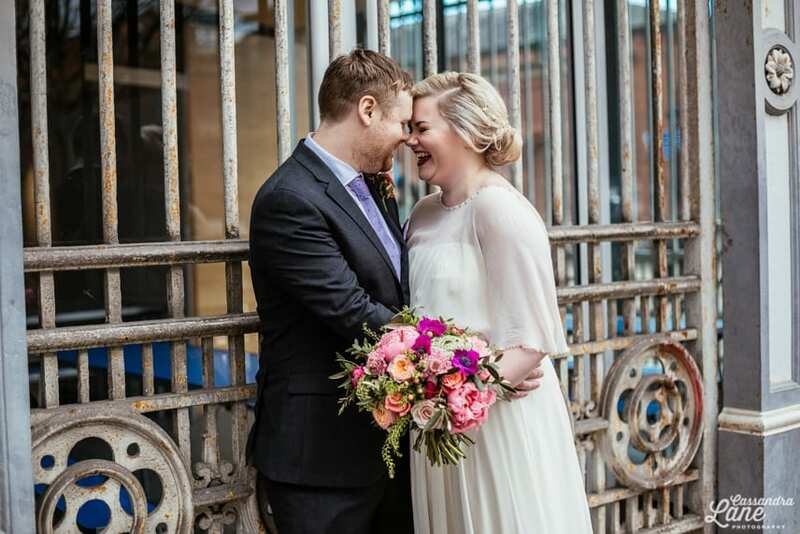 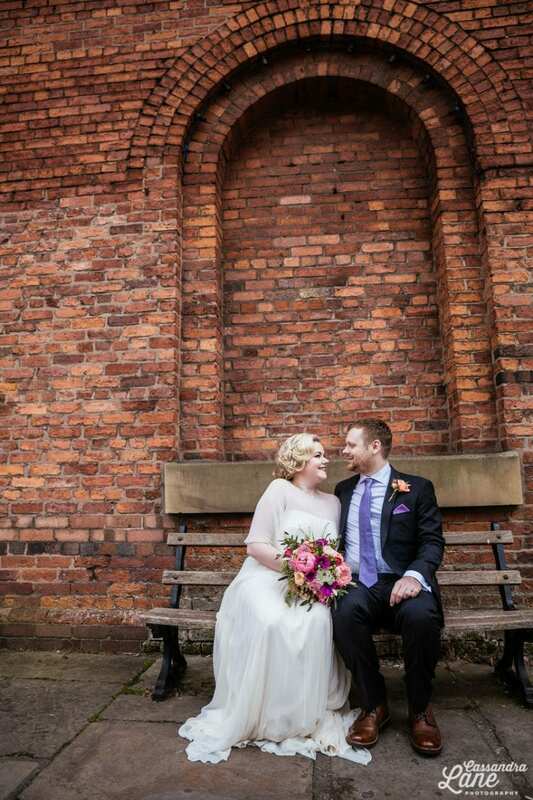 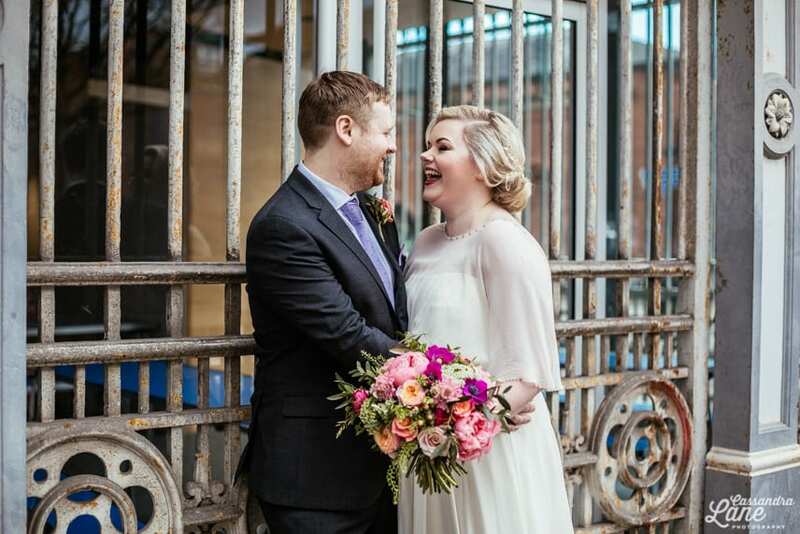 Bethany Jane DaviesFrog FlowersGreat John St HotelJenny PackhamManchester Wedding PhotographyThe White Closetvintage wedding photographyVintage Wedding Photography Great John St.